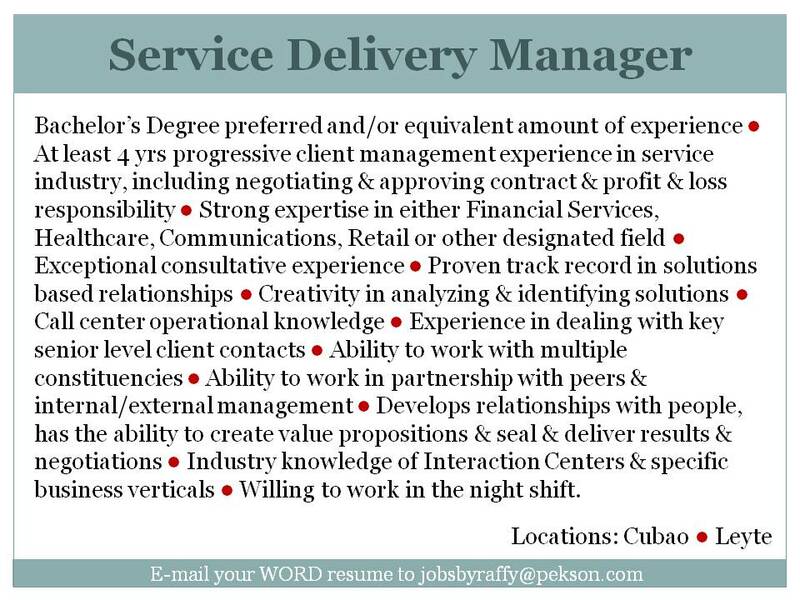 The company is a full-service communications company and has been serving Guam for over 40 years, investing $50 million over the last 5 years on network infrastructure and back office systems. 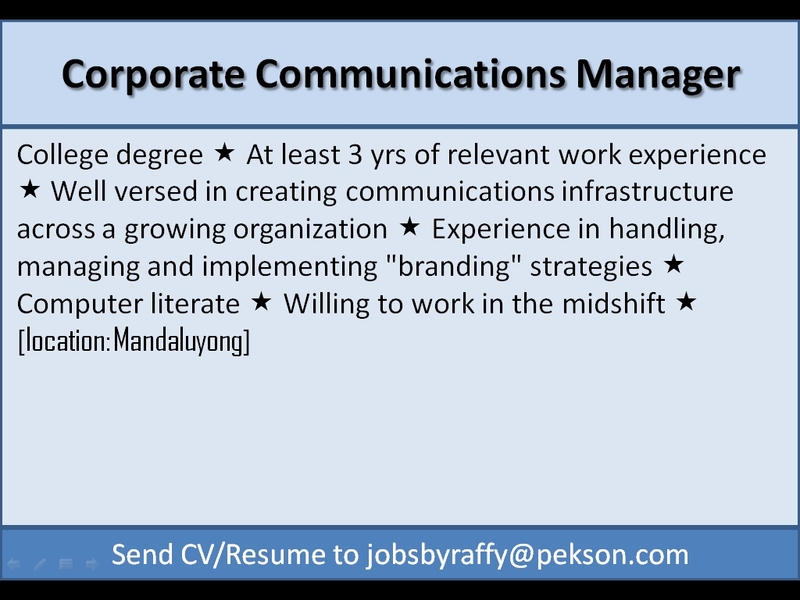 The company’s management team with deep knowledge and expertise in the areas of traditional telephony, broadband, wireless, cable, and emerging technologies. 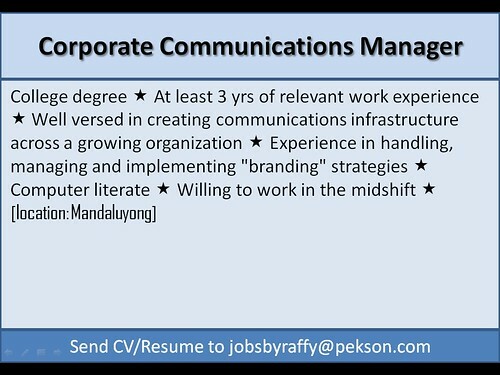 It is ommitted to building and maintaining a world-class communications infrastructure. 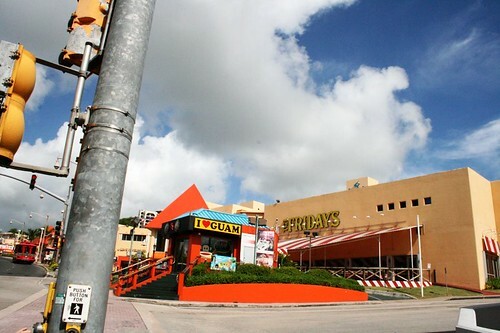 United States island territory of Guam. 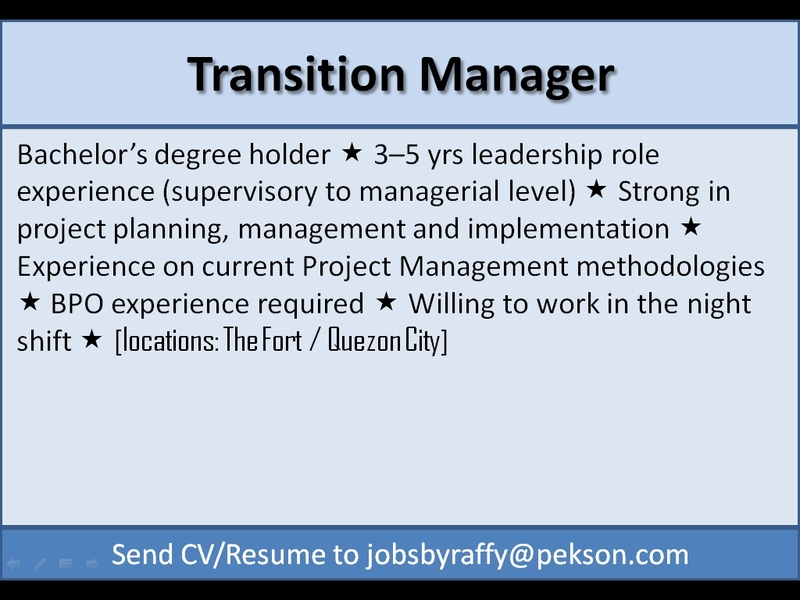 Full-time employment. 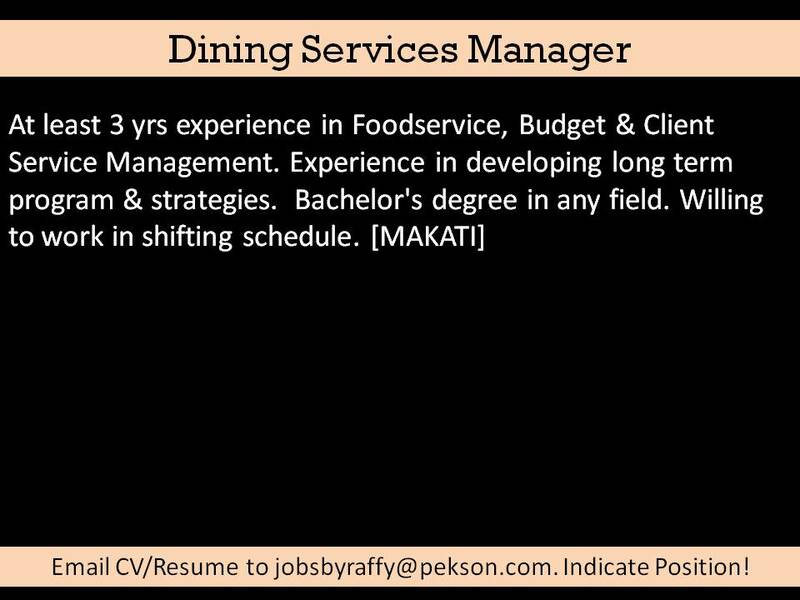 For H1 positions, work duration is indefinite. 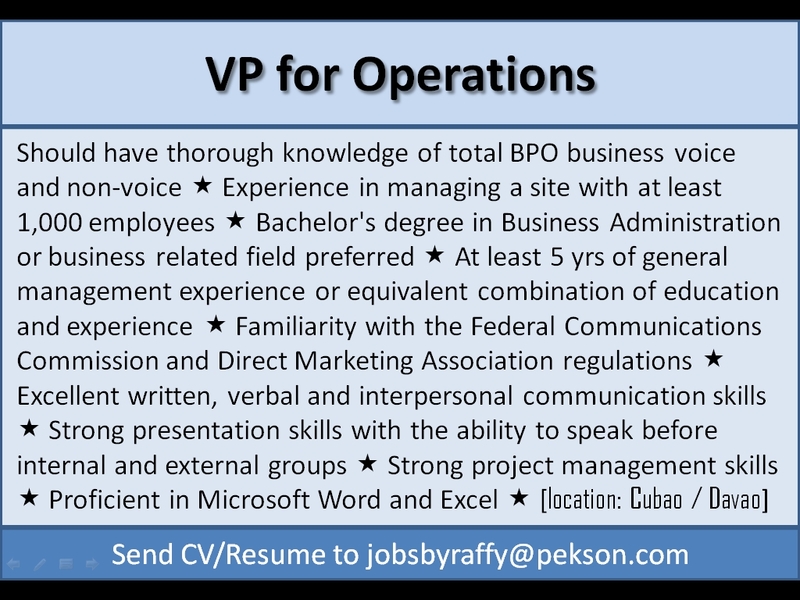 Senior IP Network Engineer – US$60,000 to US$63,000 P.A. 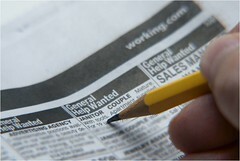 Cisco Certified Internetwork Expert (CCIE) – US$63,000 to US$73,000 P.A. 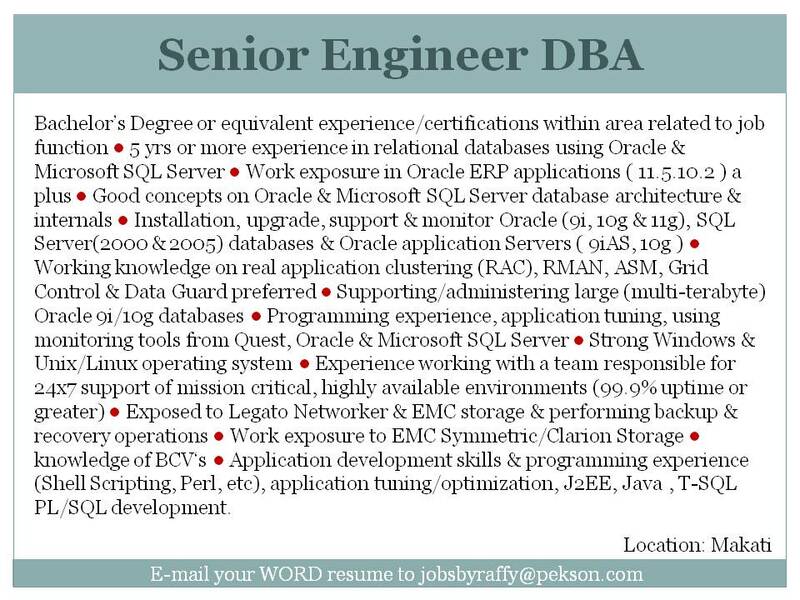 The ideal candidate is expected to have an in-depth knowledge of WAN, BGP, OSPF, ISIS, Security and MPLS based networks. 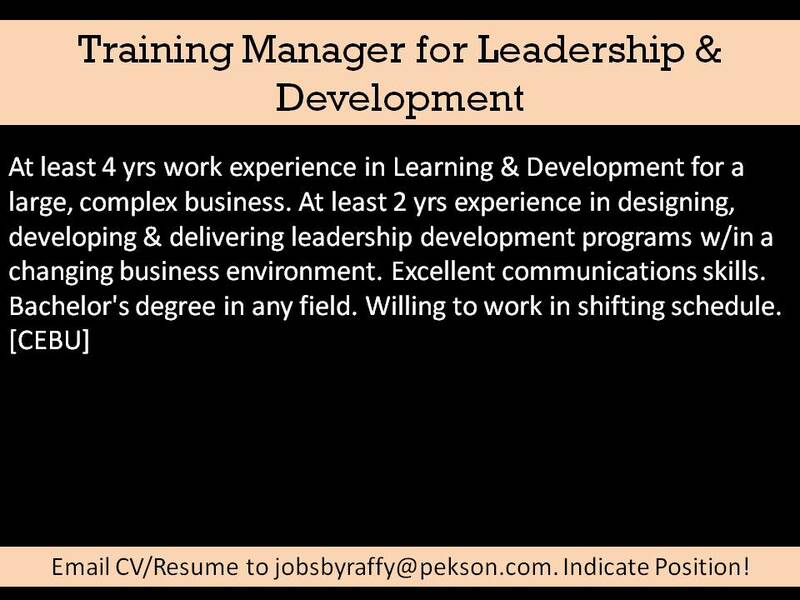 The person must be proficient and experienced in design, development, implementation, testing and operation. 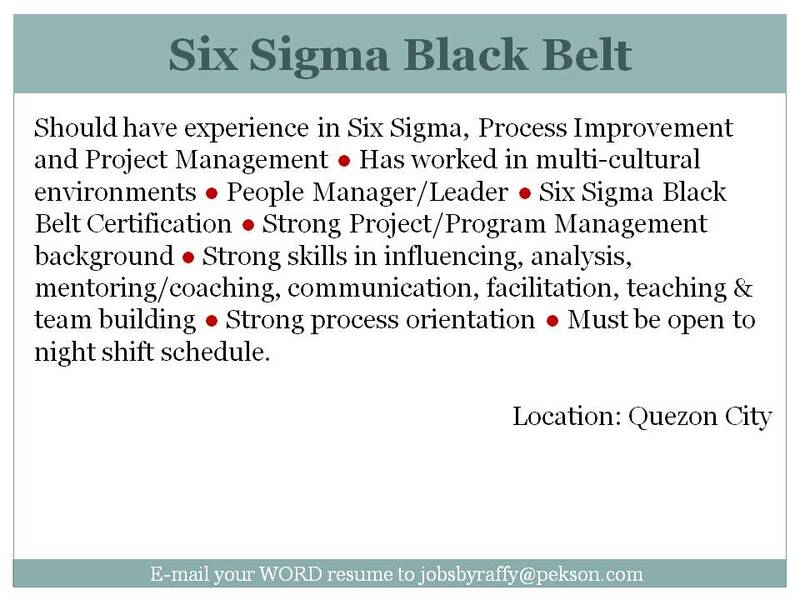 BS or equivalent work experience. 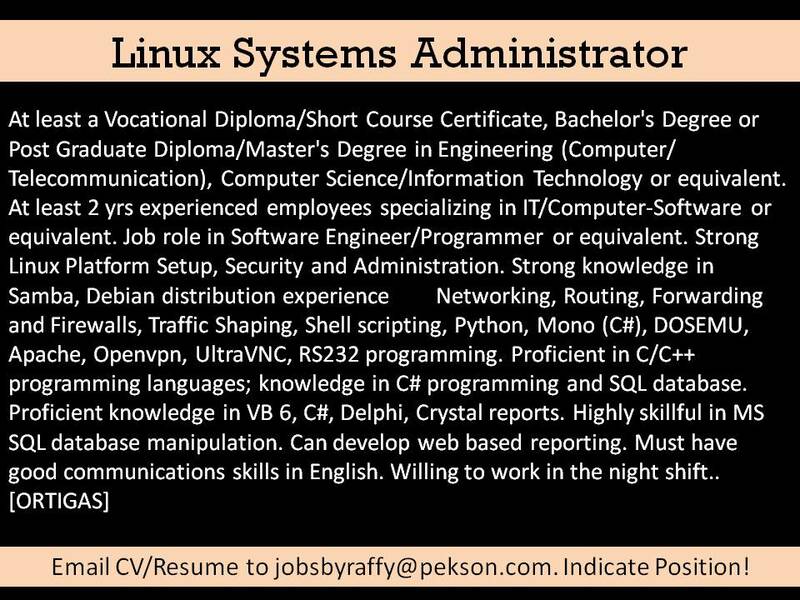 CCIE a must; CISSP a plus. 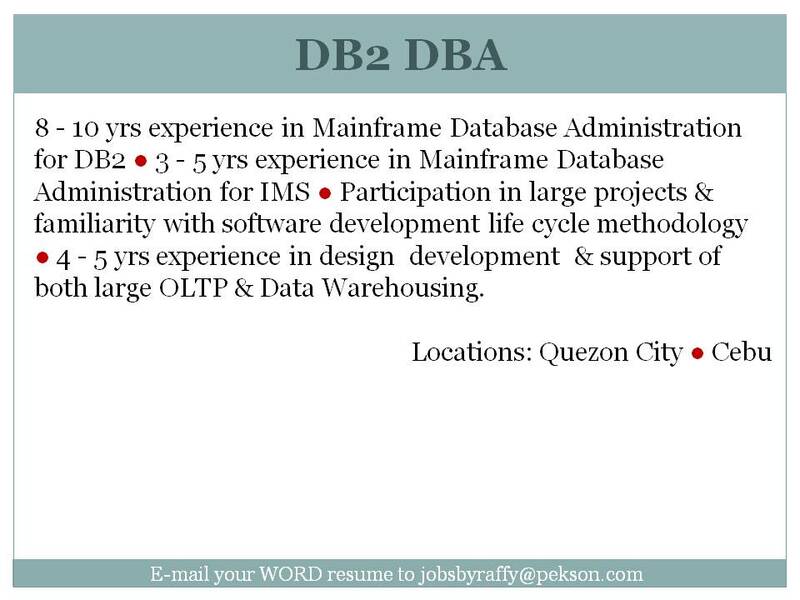 10 plus years of experience in Network Engineering and support for mid-large multi-location network environment. 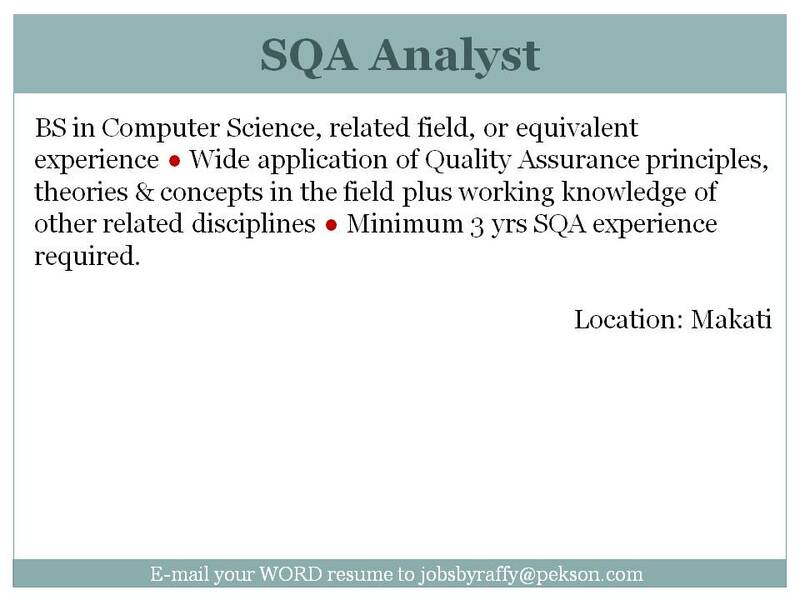 MPLS with Qos and Traffic Engineering experience required. 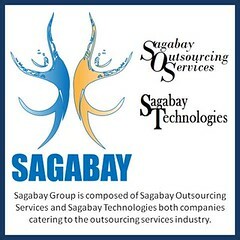 Multi ISP multi-site Internet eCommerce architectures. 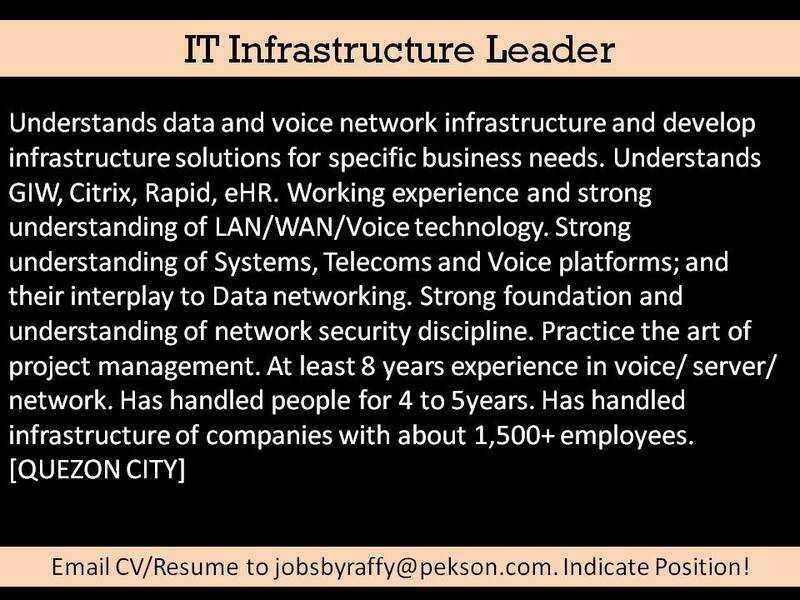 Advanced knowledge of L3 routing protocols – BGP, EIGRP, OSPF, ISIS a must. 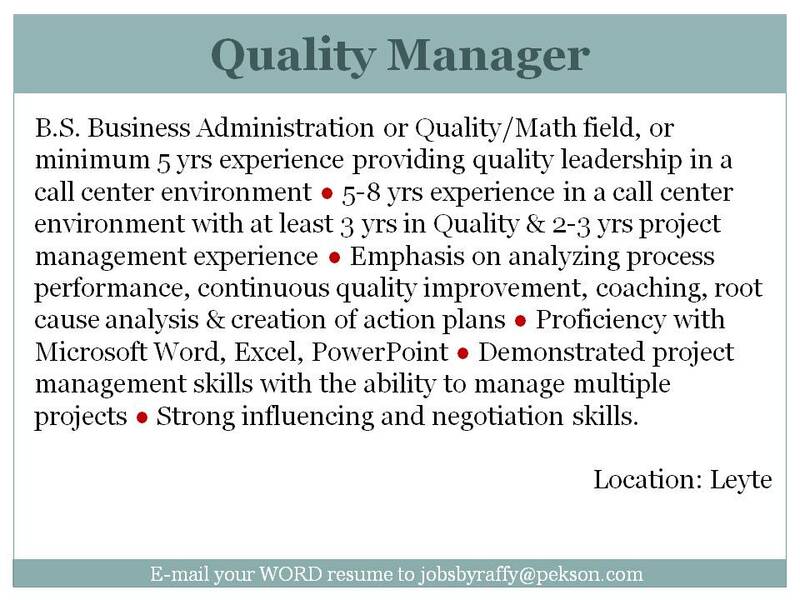 Ability to manage projects independently using project application software. 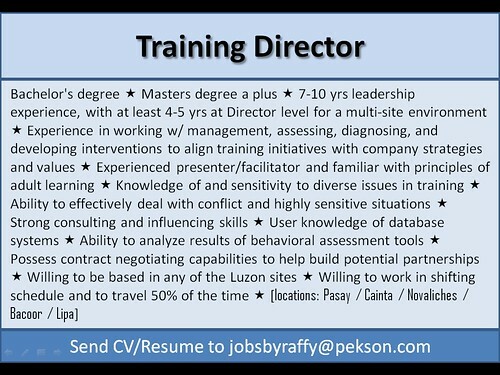 Provide technical leadership and directions as a primary technical resource on IP router network technologies. 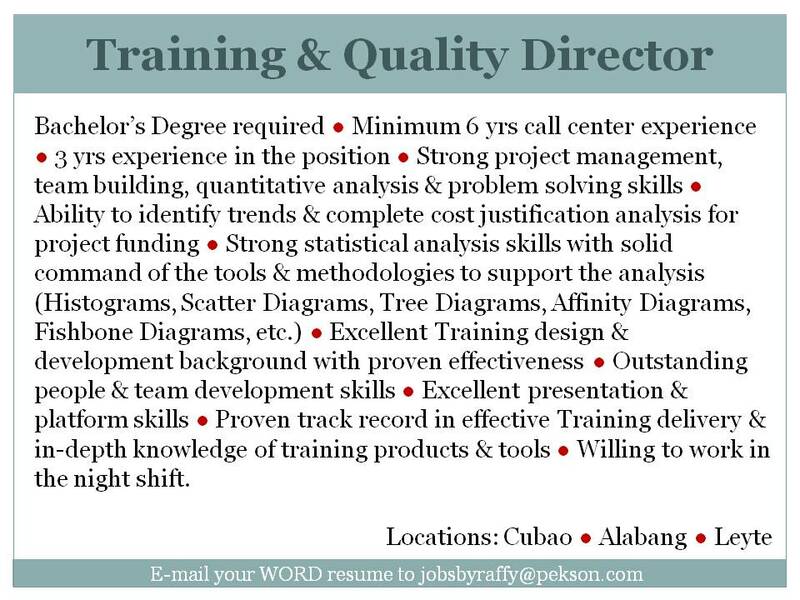 Analyze IP network design and traffic flows for network optimization in the Regional Area Networks. Interface with Capacity planning to analyze traffic engineering data to forecast network capacity requirements. 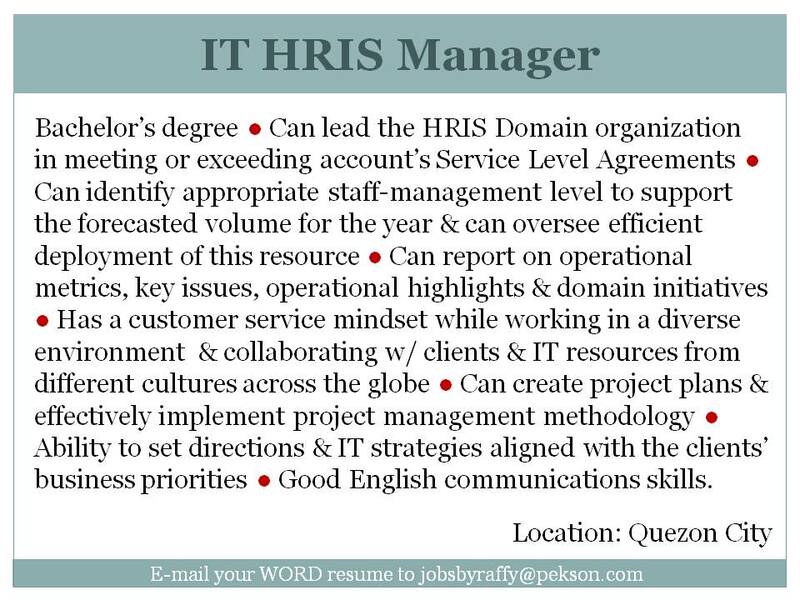 Provide technical support for IP network problems. 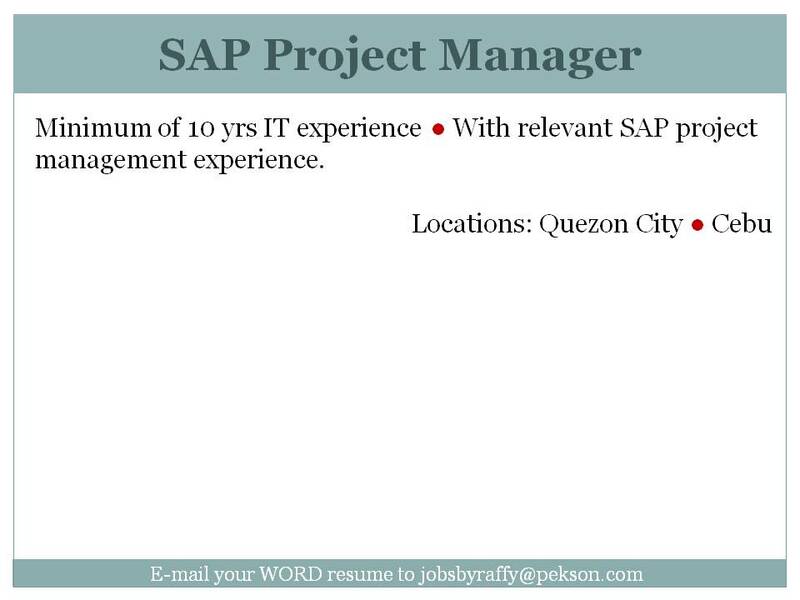 Develop test and acceptance criteria for IP networks. 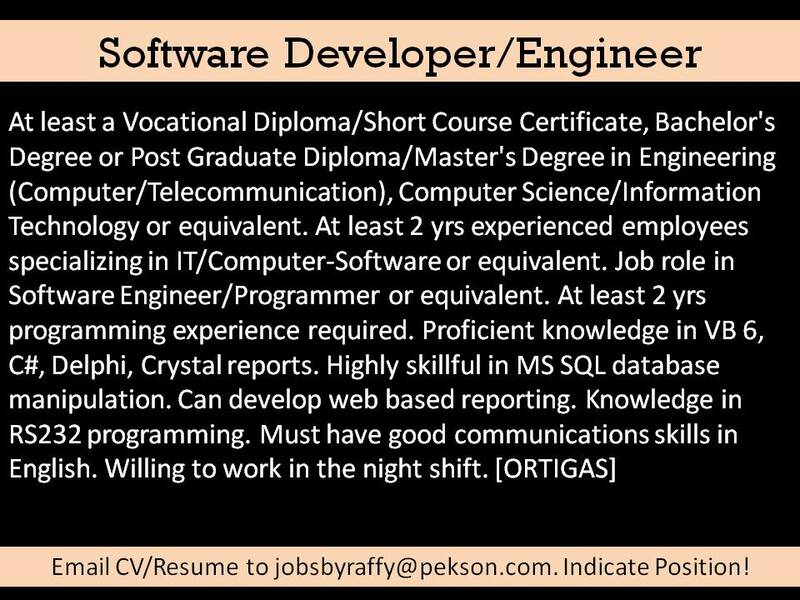 Provide technical training to junior engineers and other Ops groups on current and future technology. 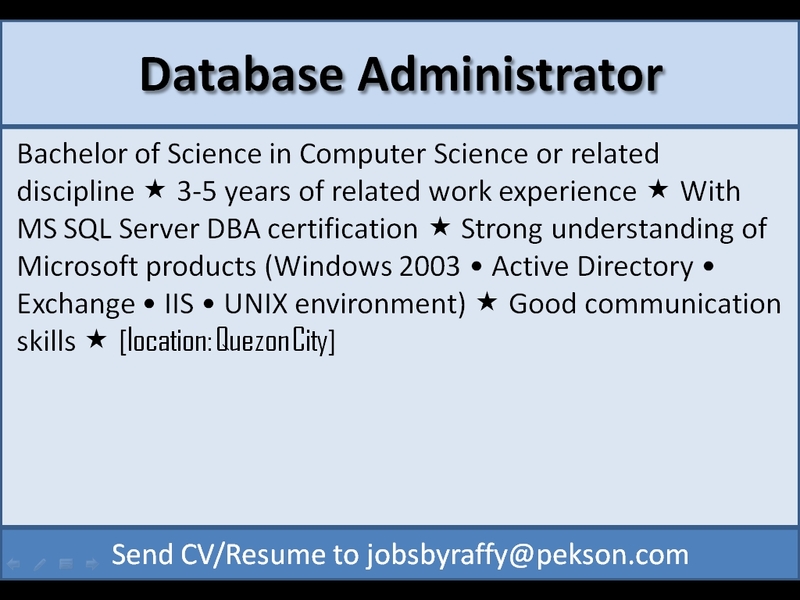 Knowledge of Internet Service Provider server applications a plus. 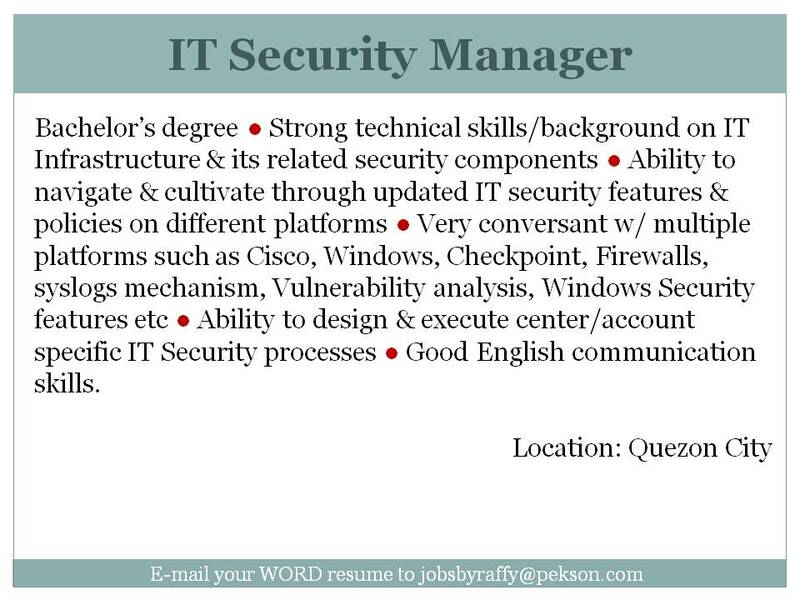 Knowledge of firewalls, DNS a must. 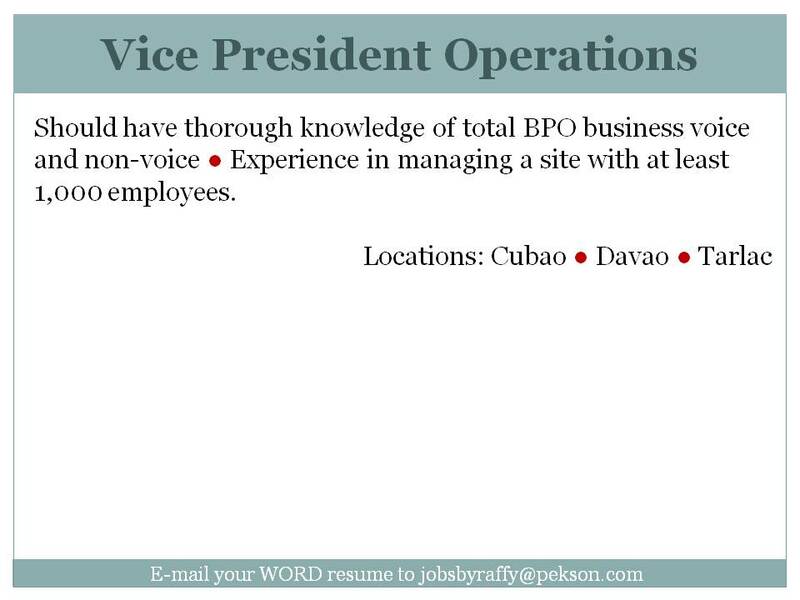 Knowledge of IP telephone (VOIP) and video conferencing a plus. 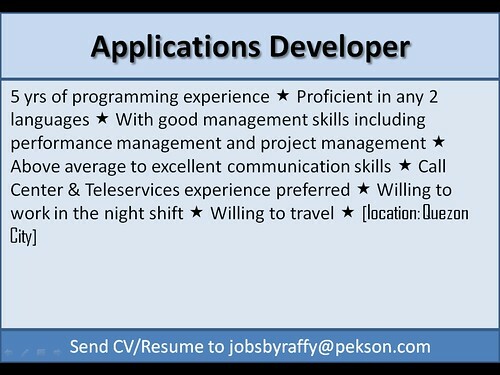 Knowledge of IPTV concepts with a strong knowledge of unicast/multicast/IGMP network delivery a plus. 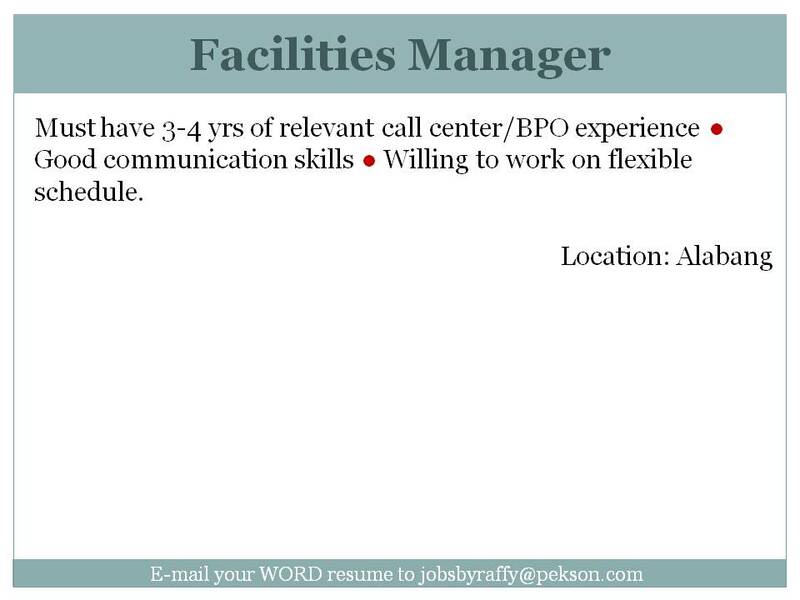 Ability to design and implement converged IP networks to support voice, data and video. 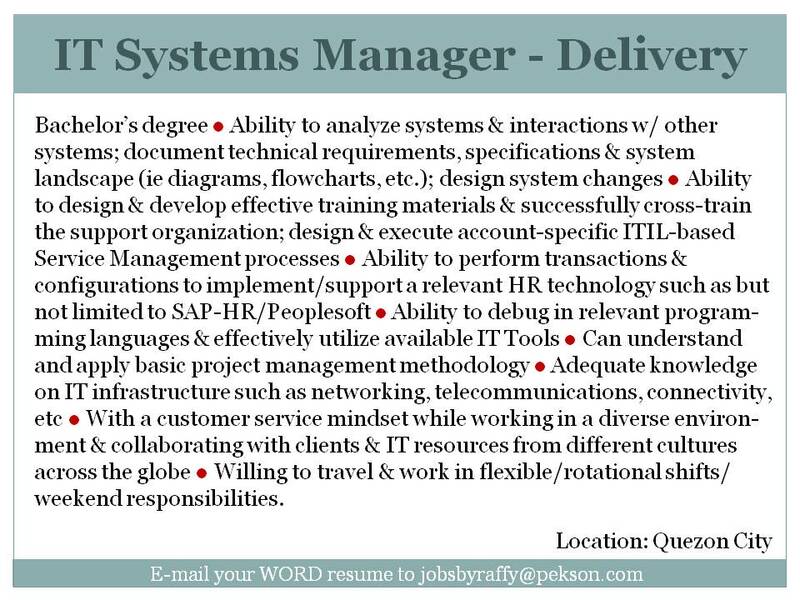 Demonstrated successes in design, implementation of complex IP systems. 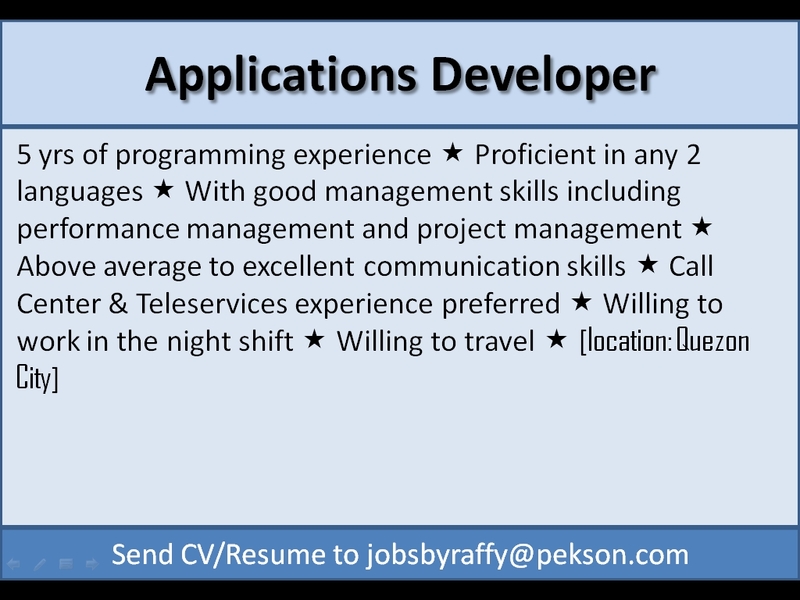 Familiarity with 3GPP (GSM, GPRS, EDGE, WCDMA, LTE) IP-based implementation details, configurations and migration strategies strongly desired. 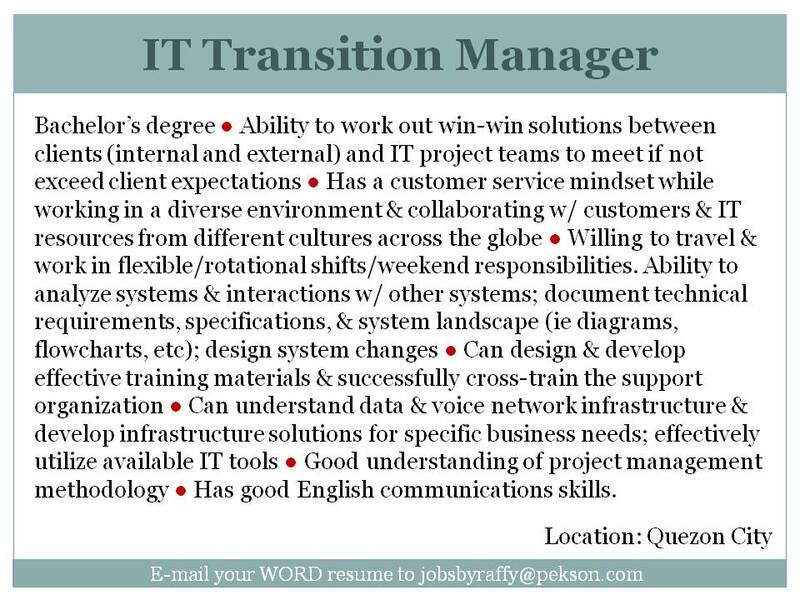 Ability to lead major network migrations and/or review network change procedures. 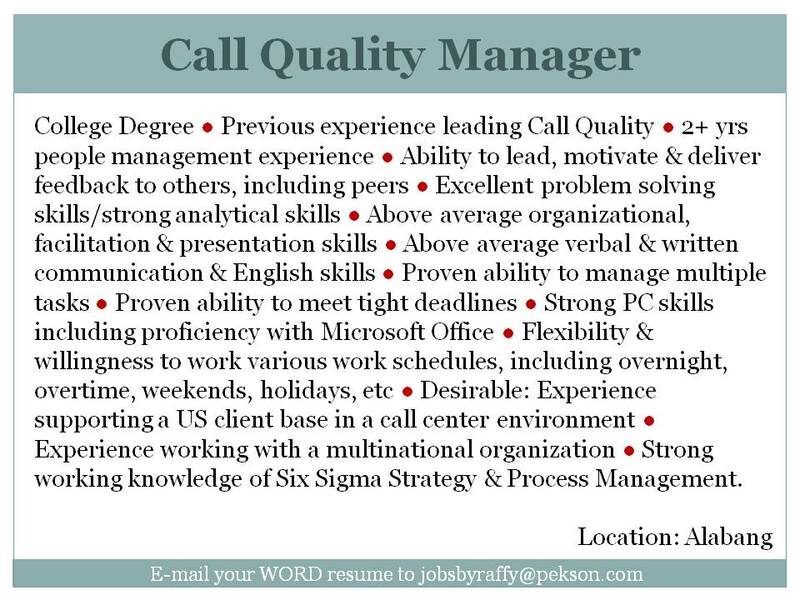 This position is open to all qualified candidates, individuals with disabilities and military veterans who are willing, able and available to perform the job, without regard to race, color, national origin, age, and citizenship. 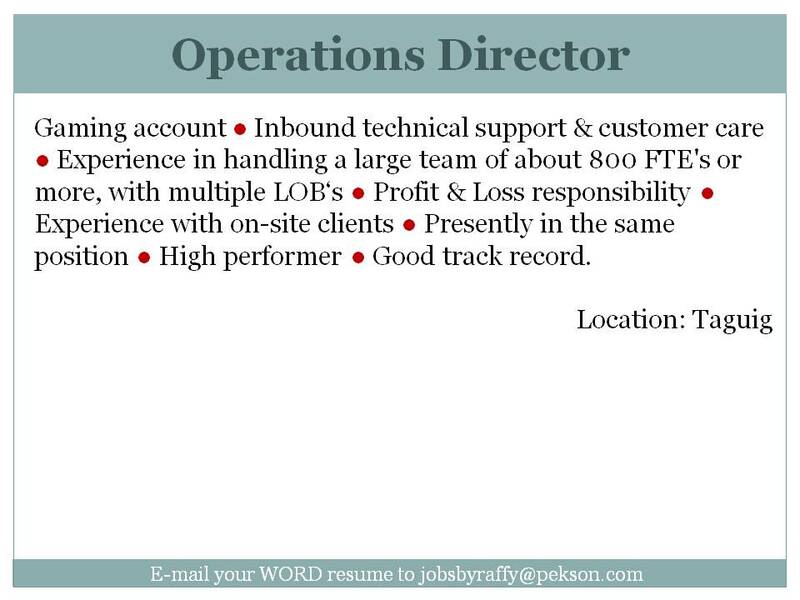 The company is an equal opportunity employer. 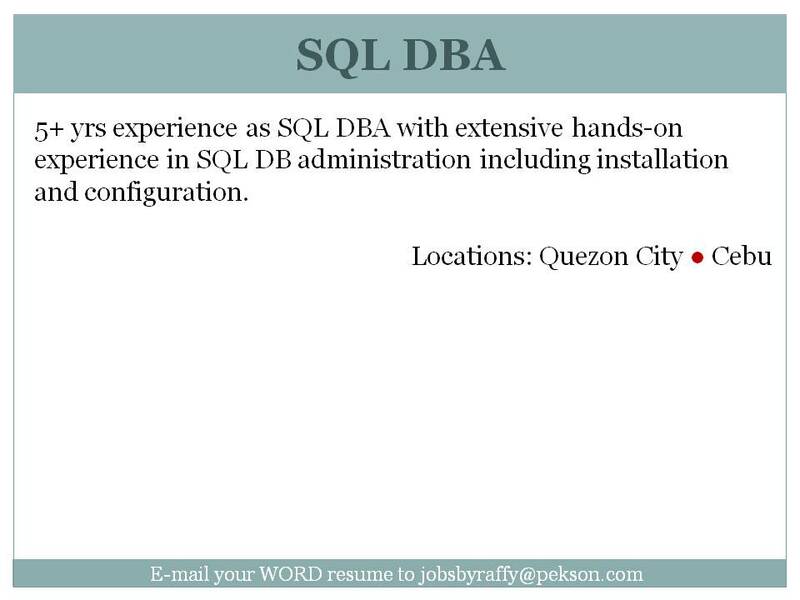 Please allow 2-4 working days for a confirmation e-mail. 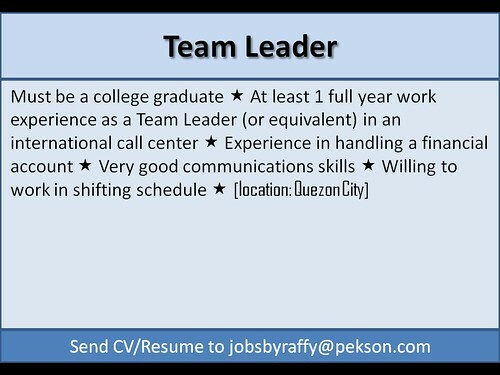 Join 7-Eleven’s store management teams. 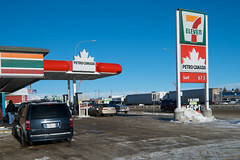 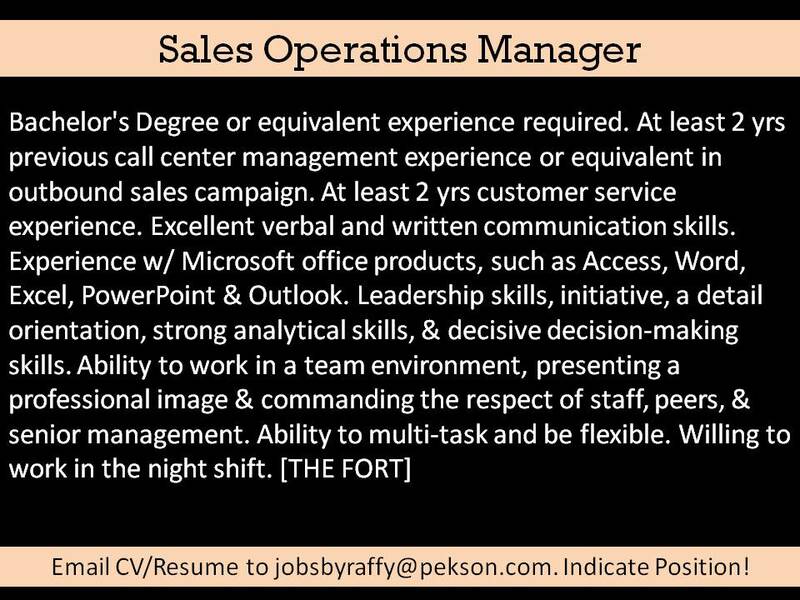 Retail operations positions are the most challenging opportunities at 7-Eleven, but also the most rewarding. 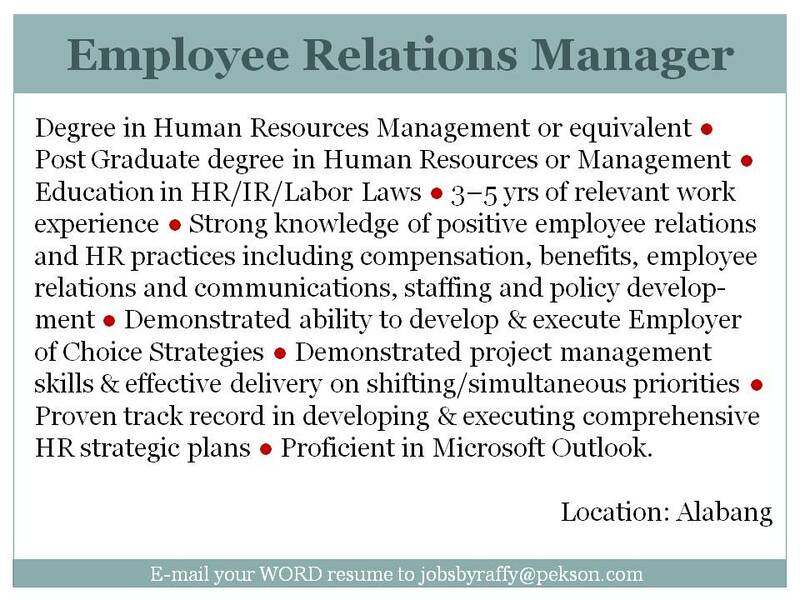 Bring copy of your resume. 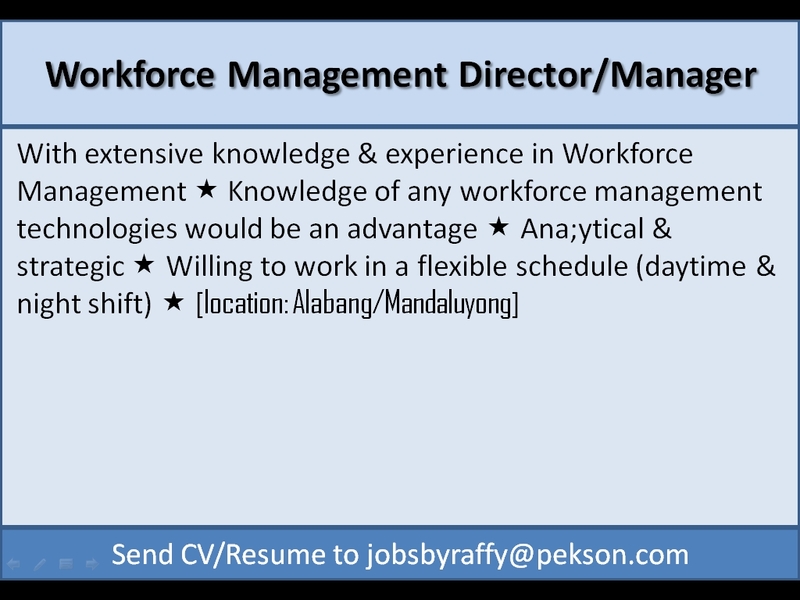 Forty-one (41) various new job openings or positions are open for application this Feburary 2010. 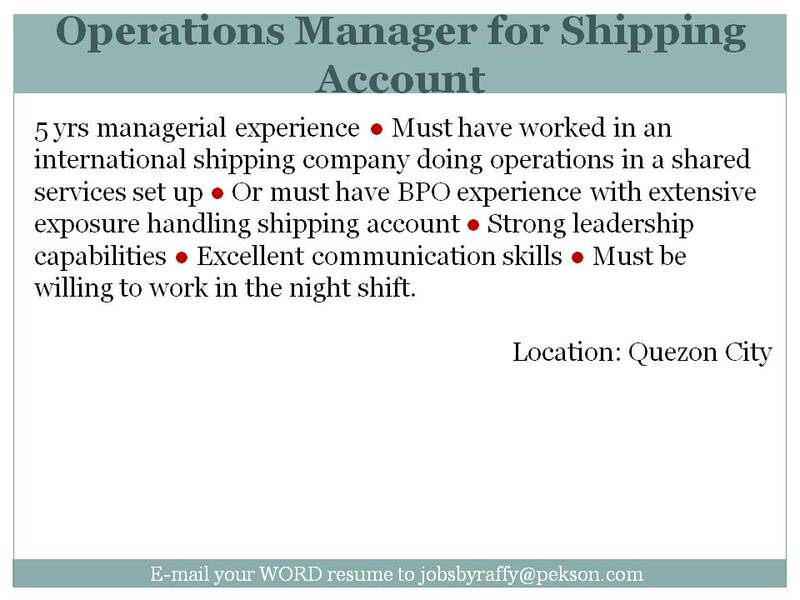 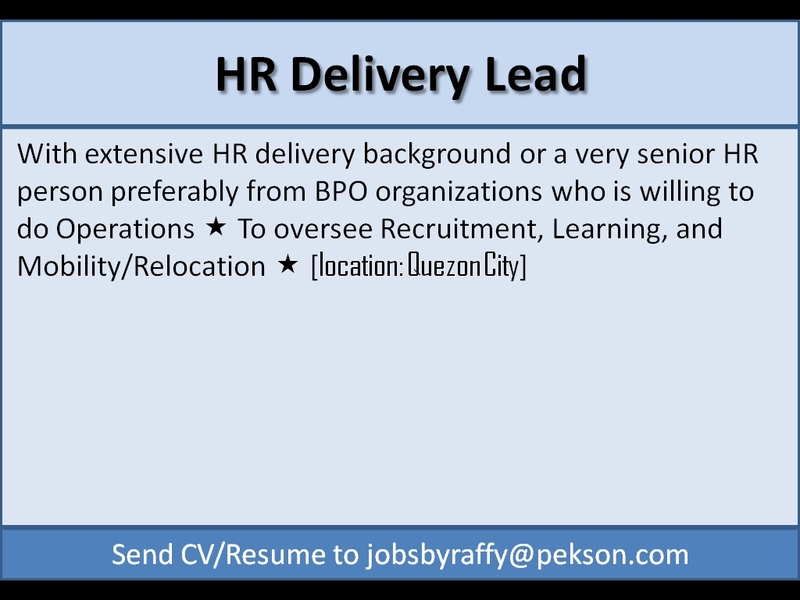 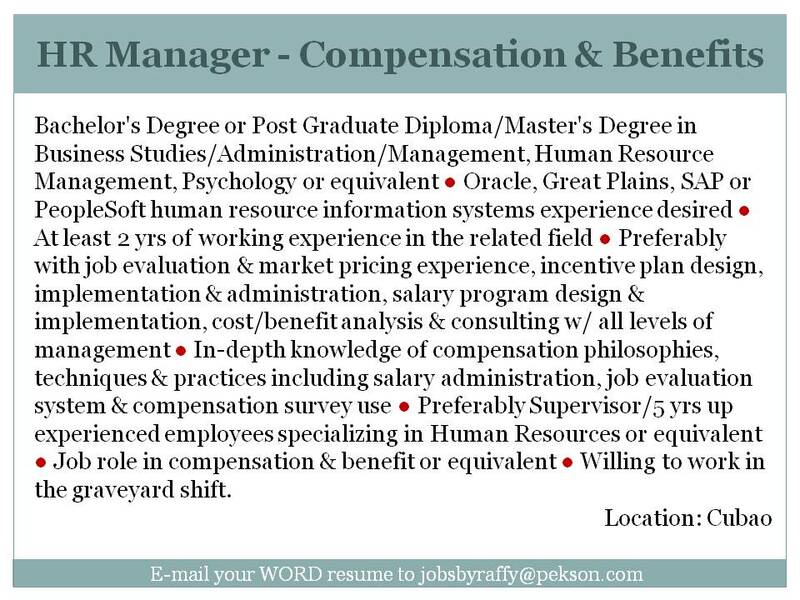 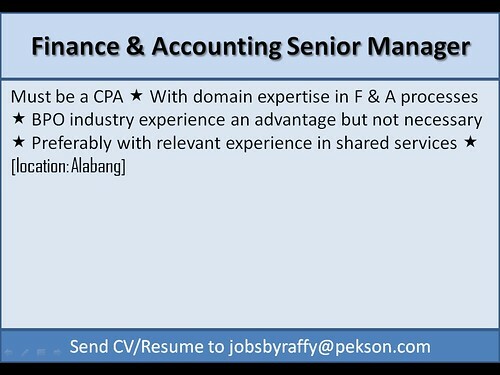 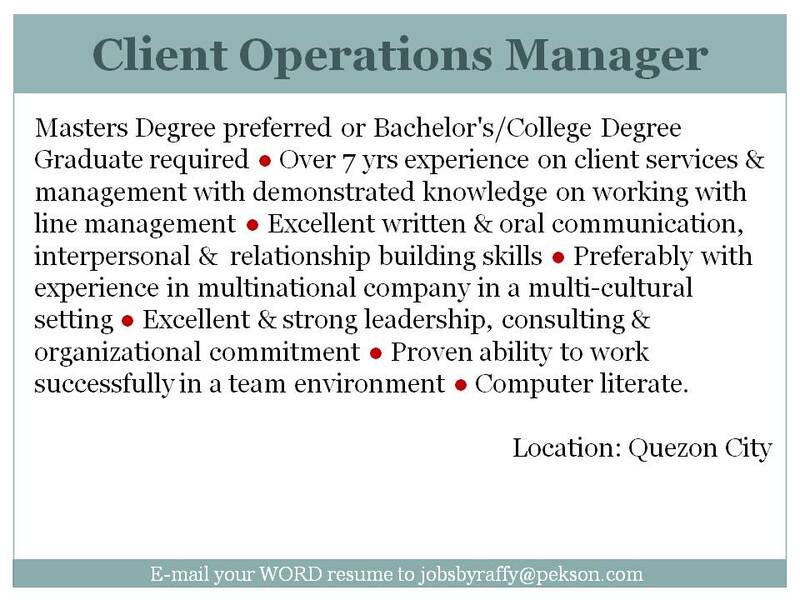 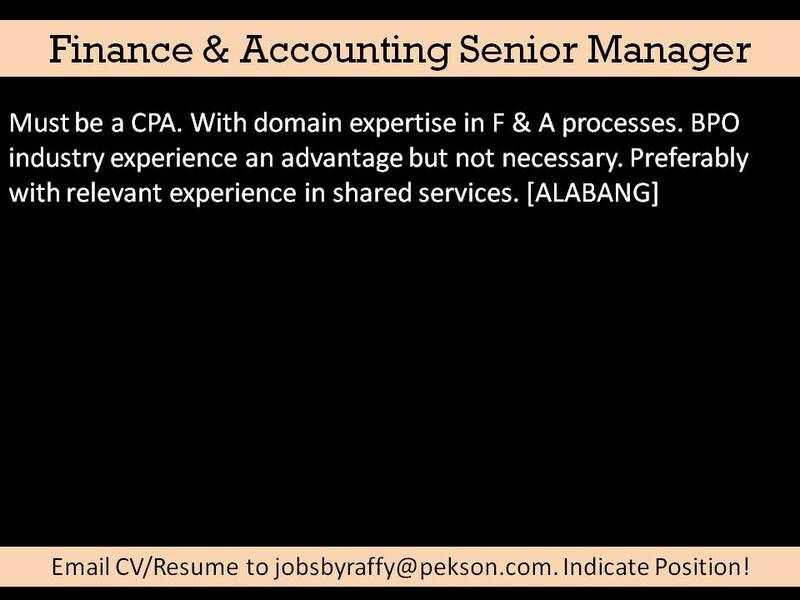 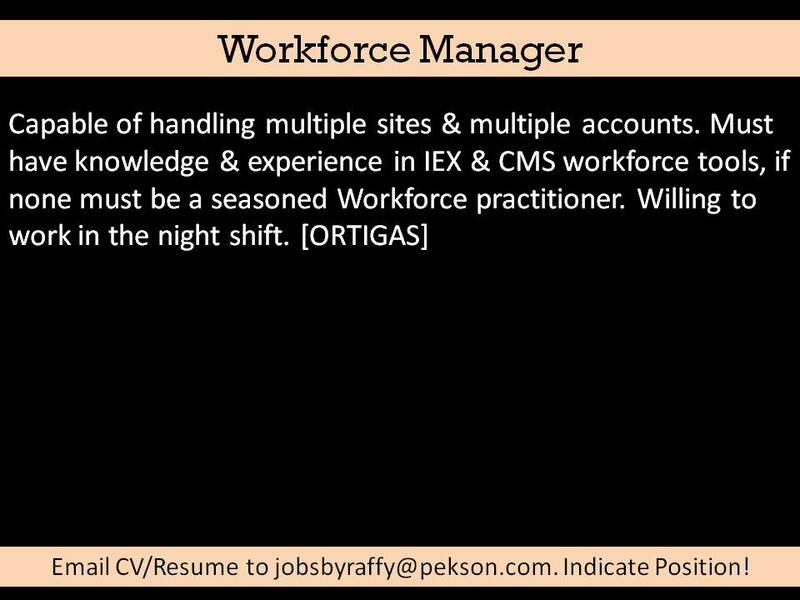 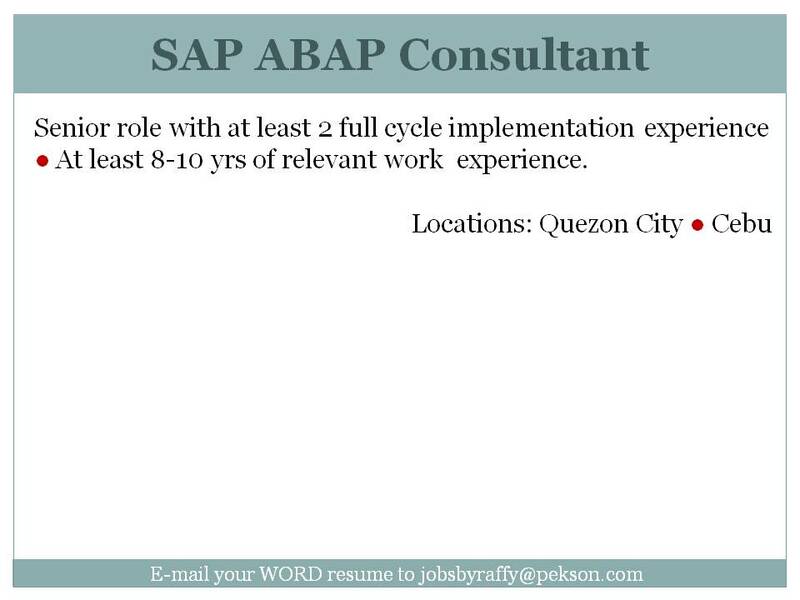 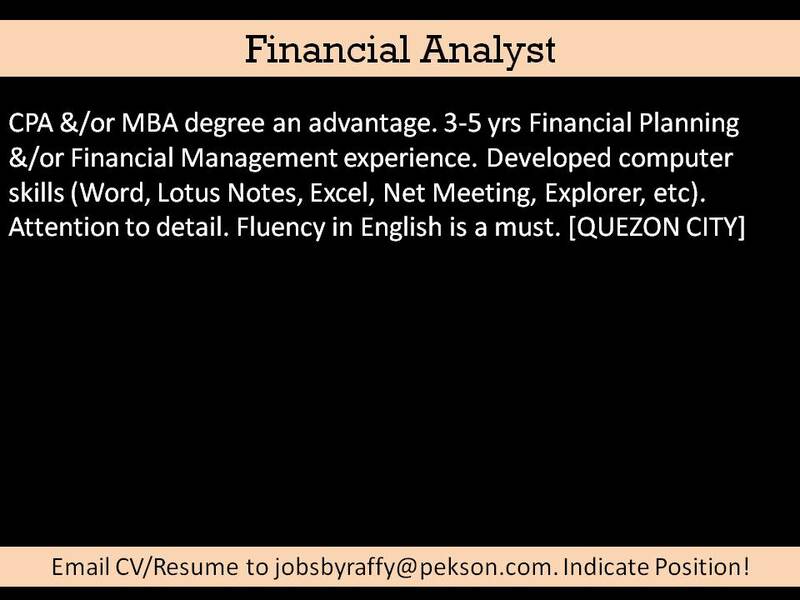 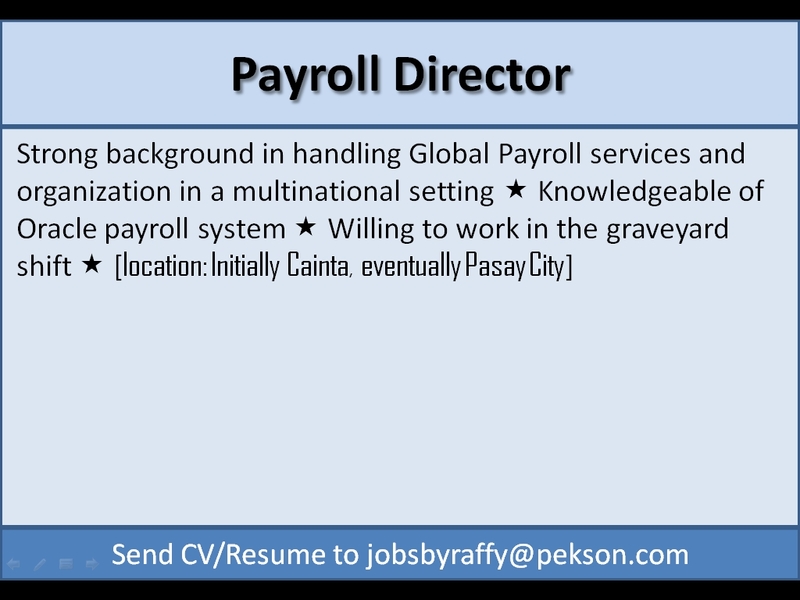 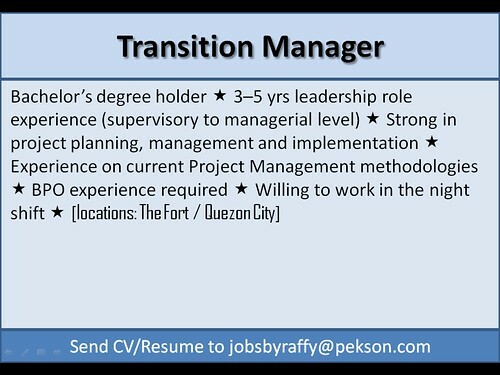 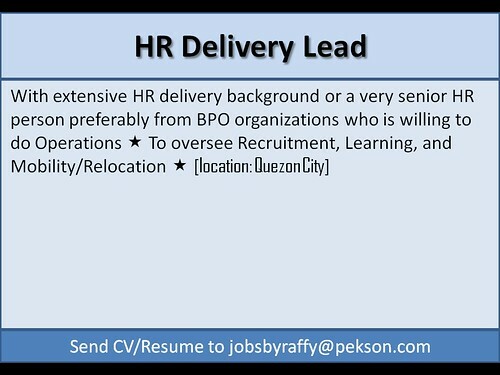 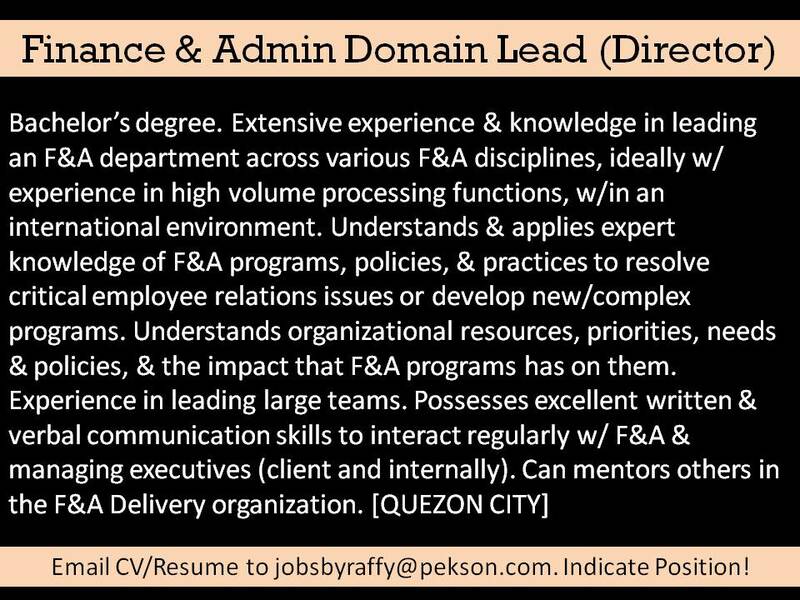 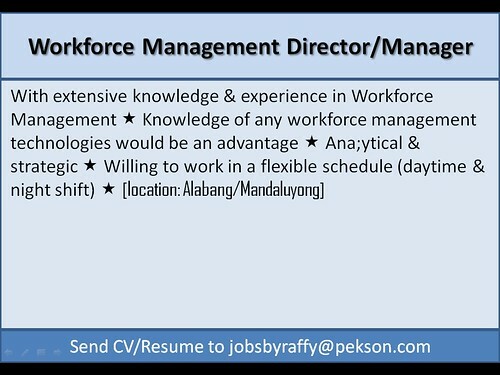 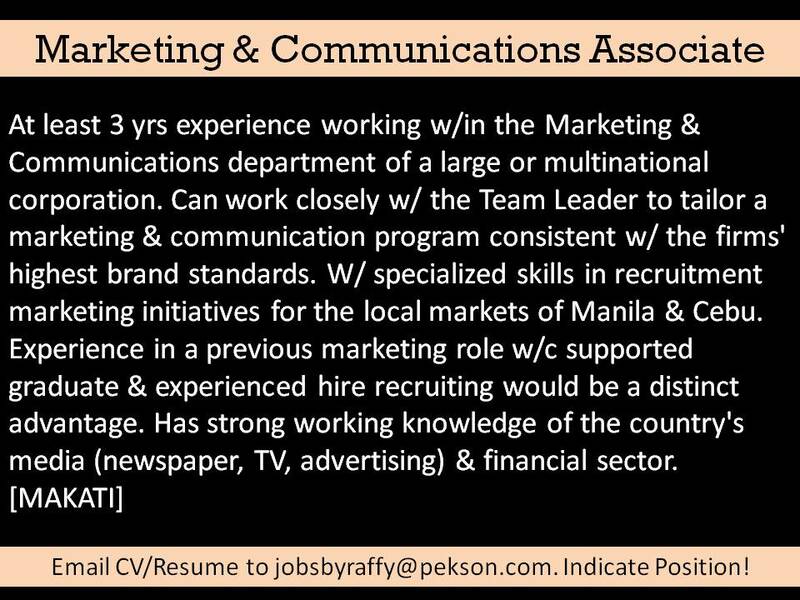 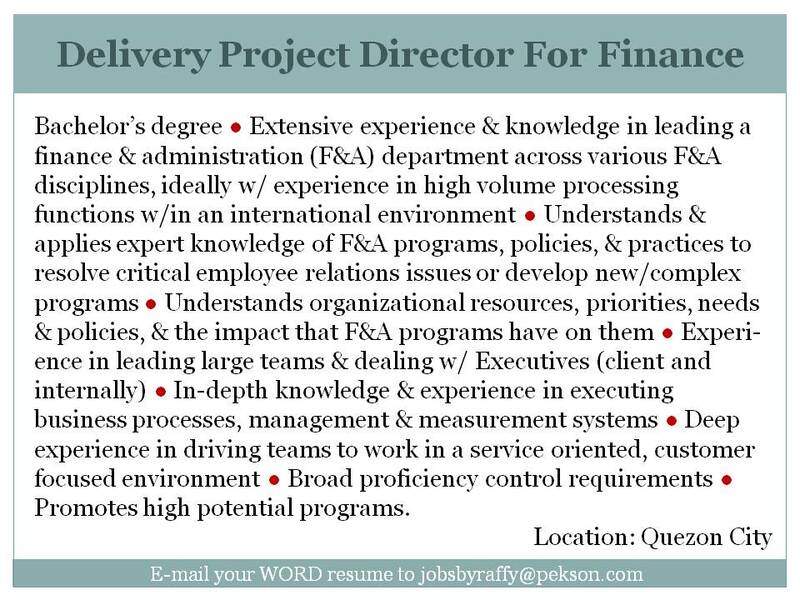 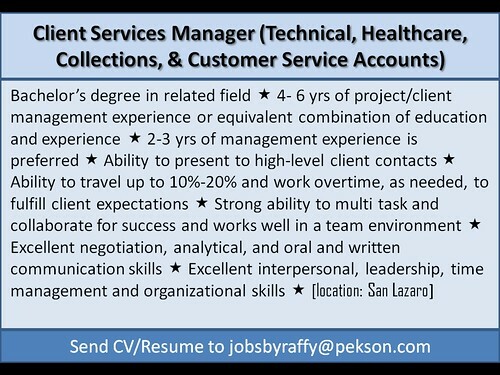 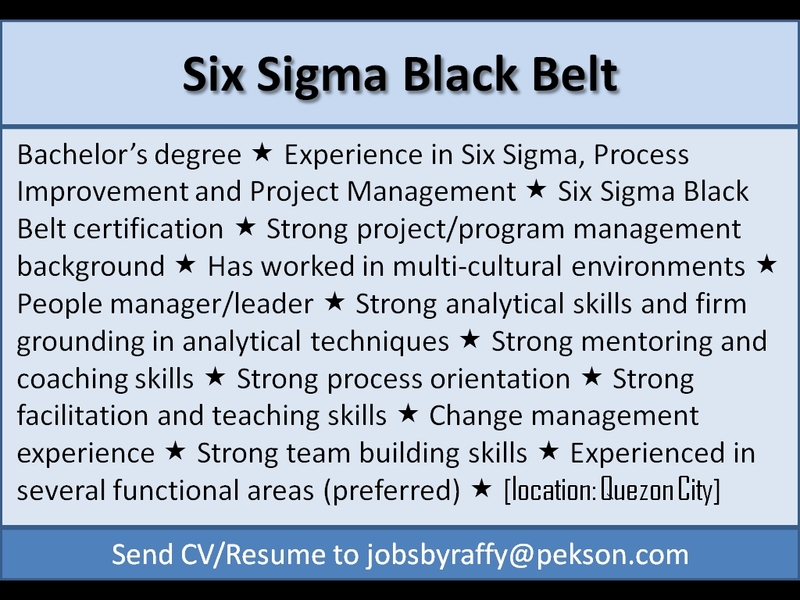 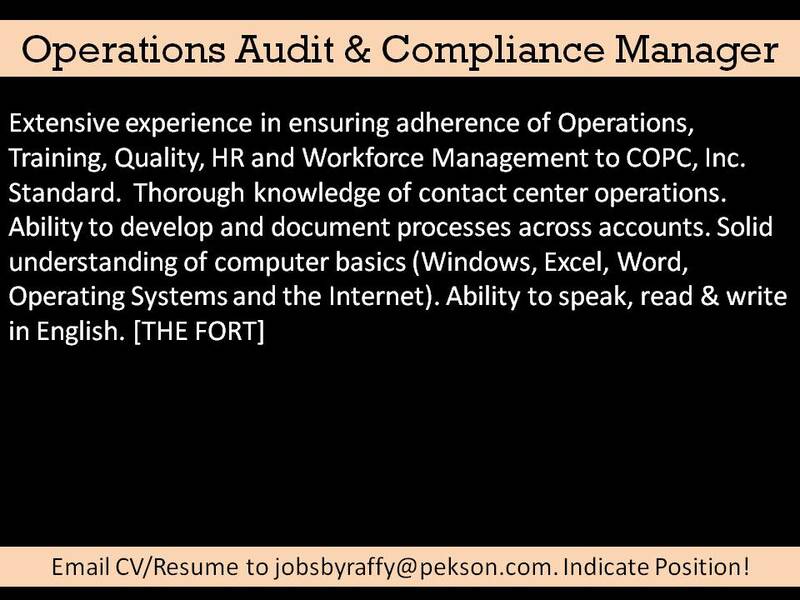 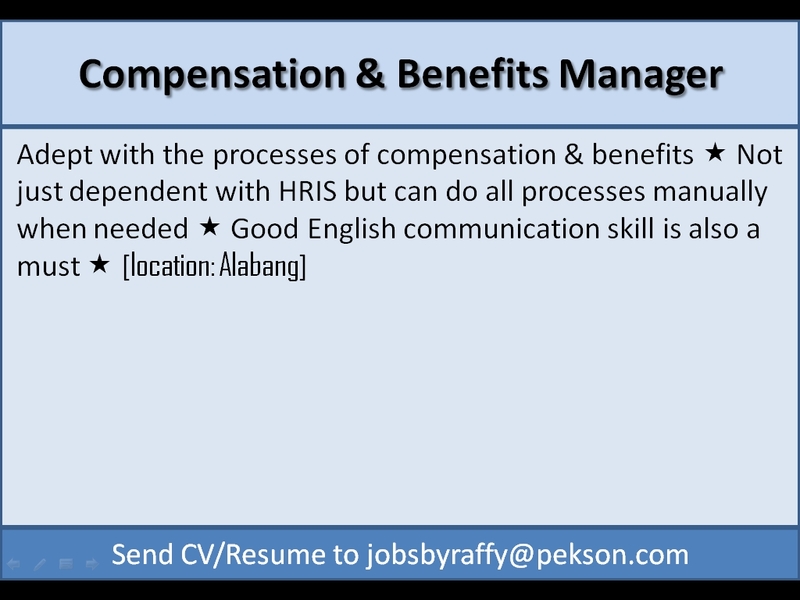 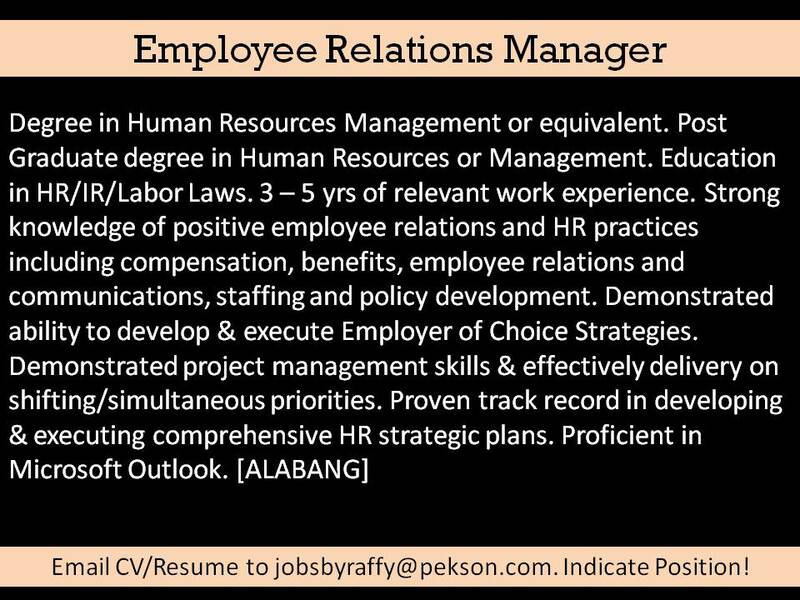 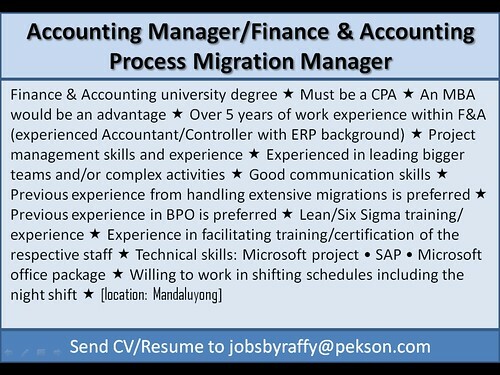 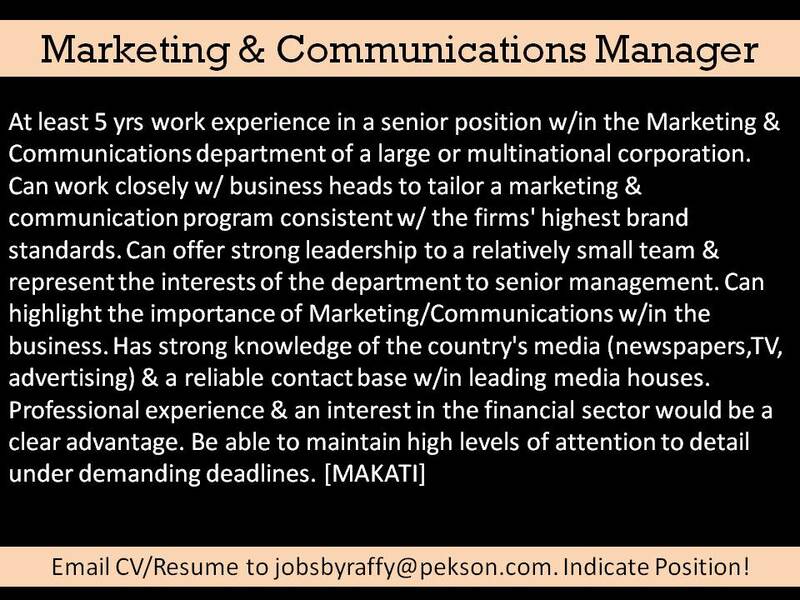 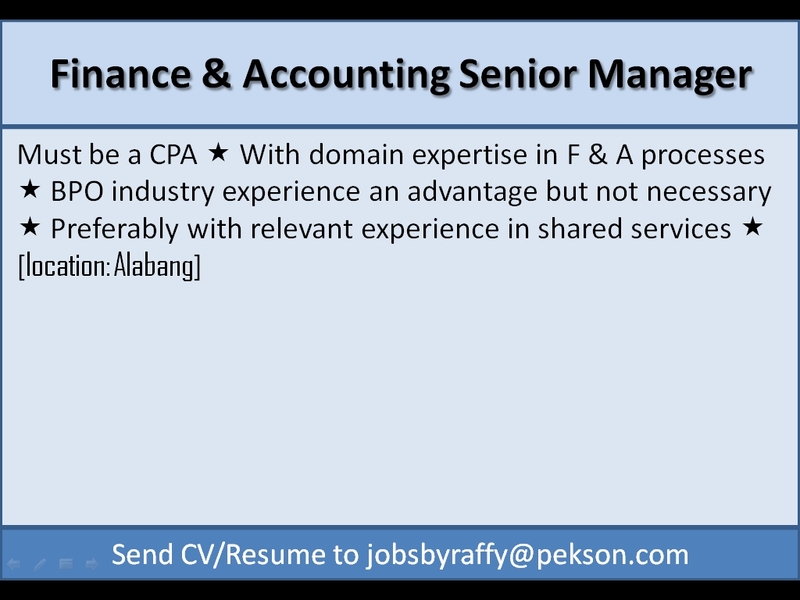 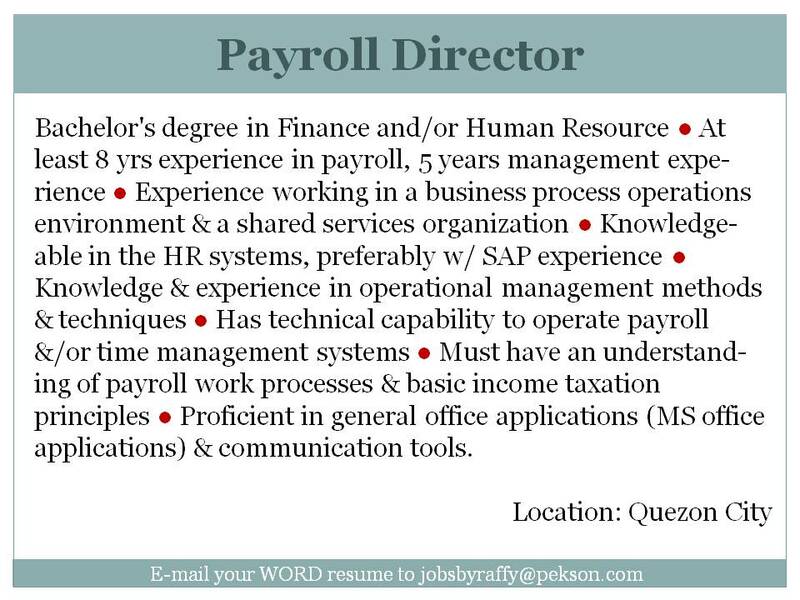 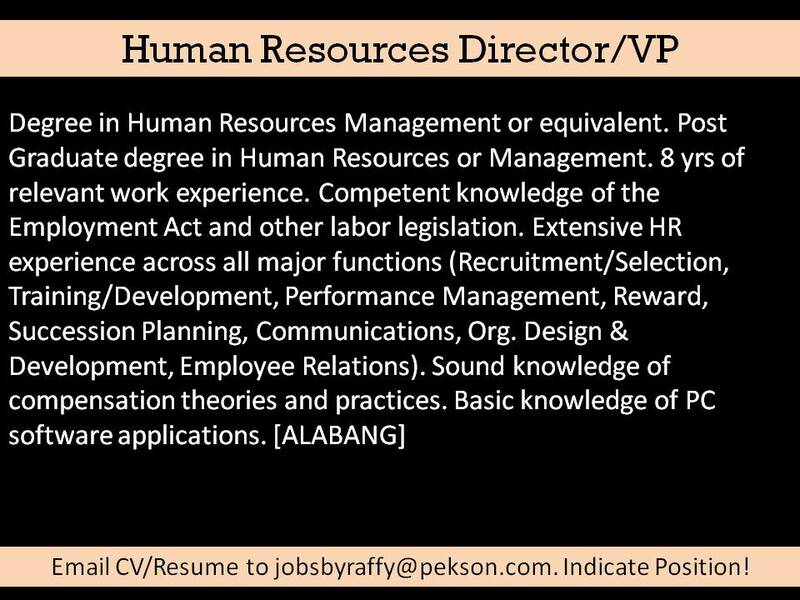 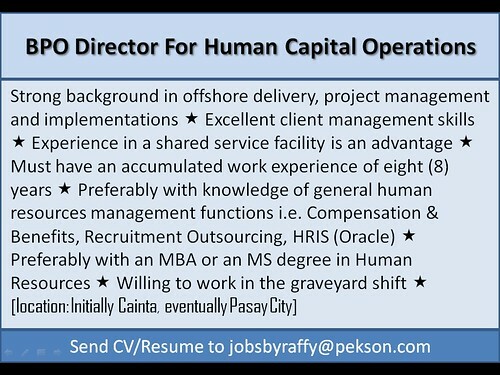 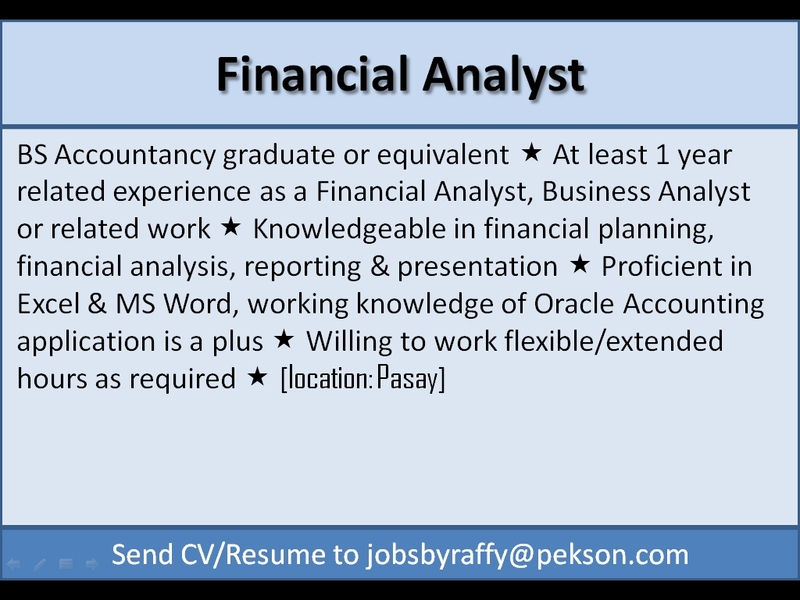 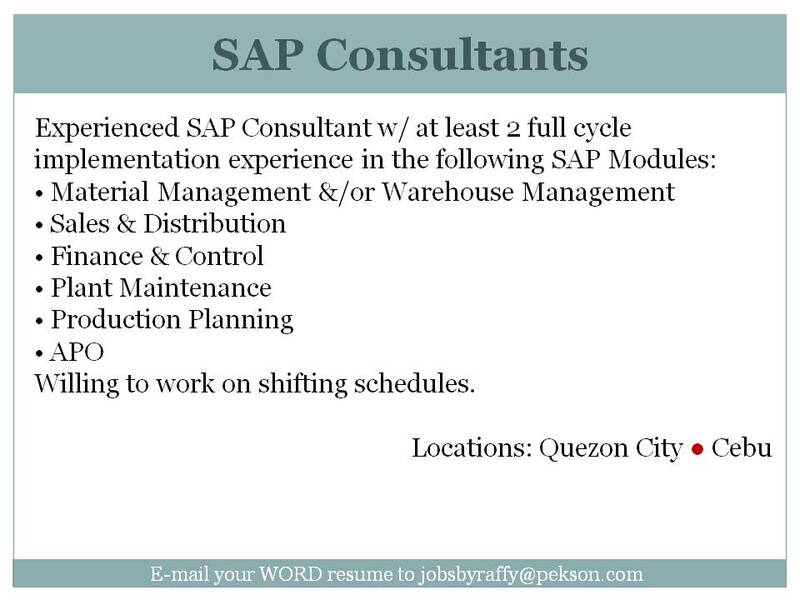 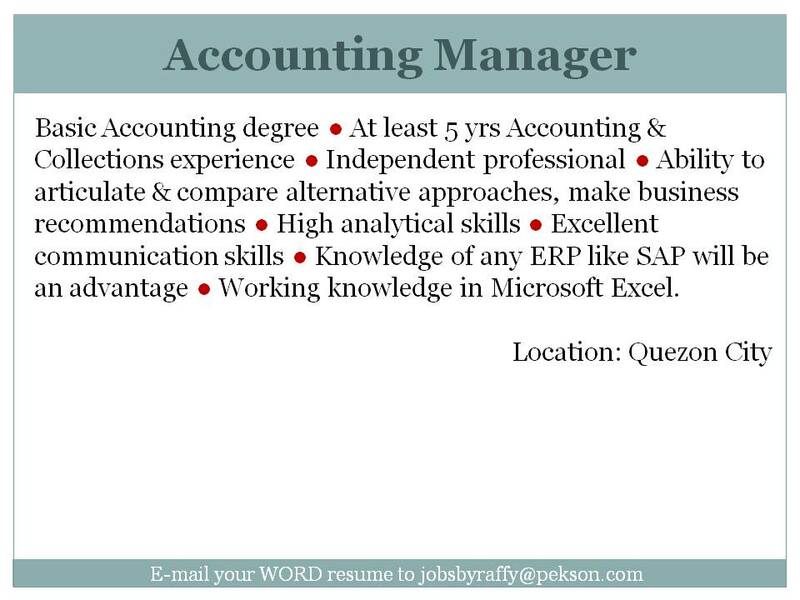 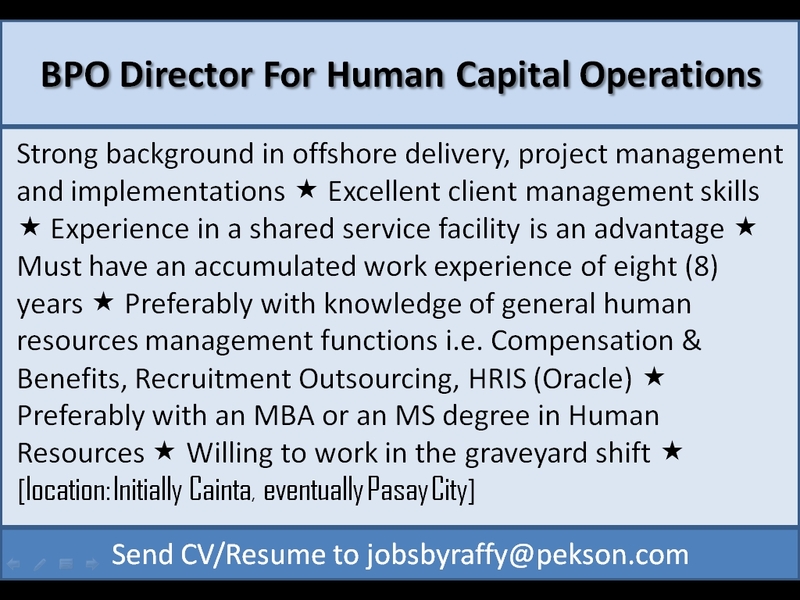 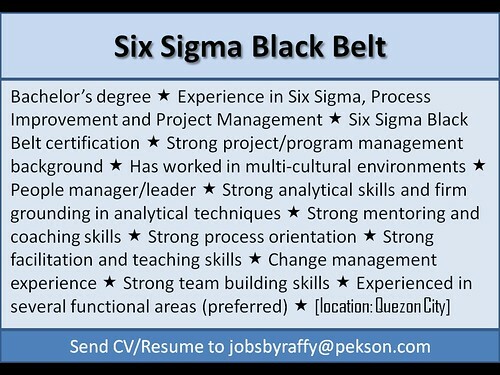 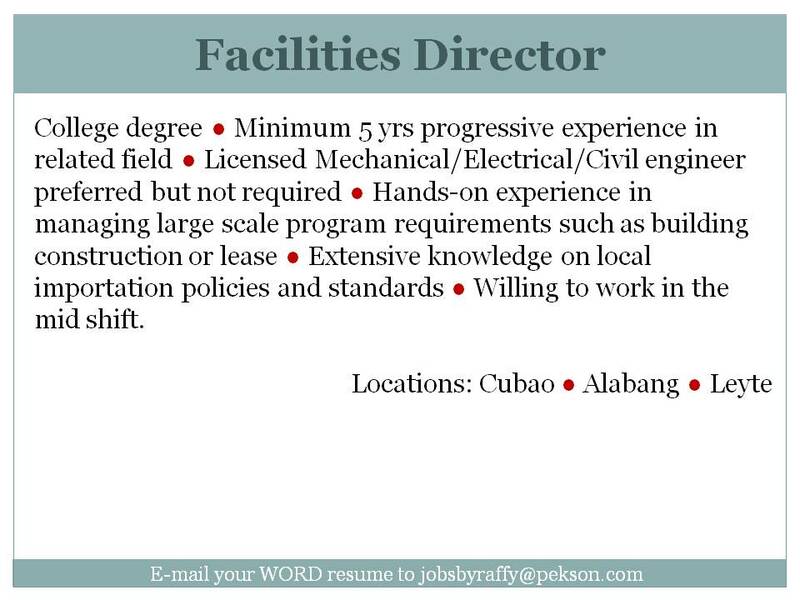 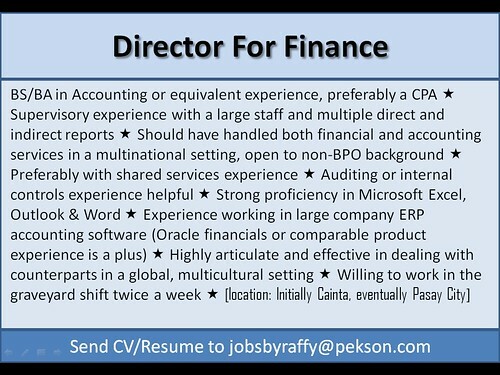 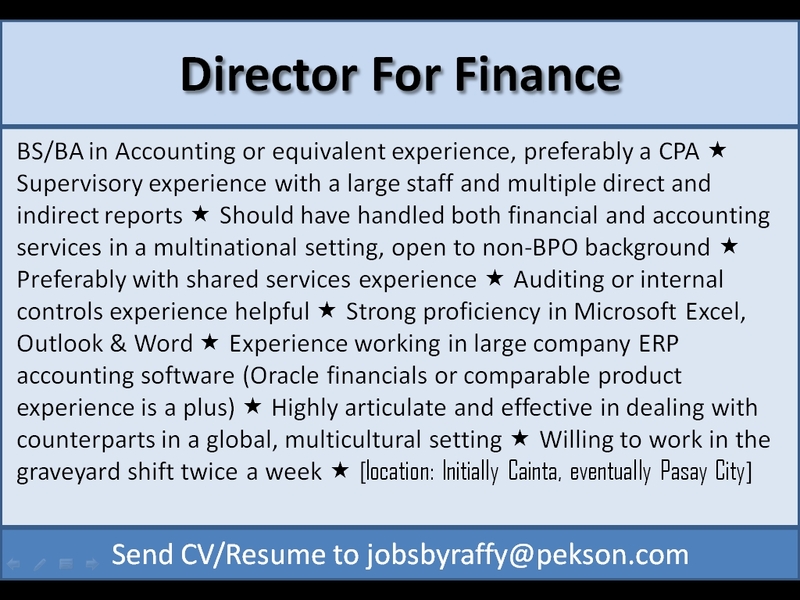 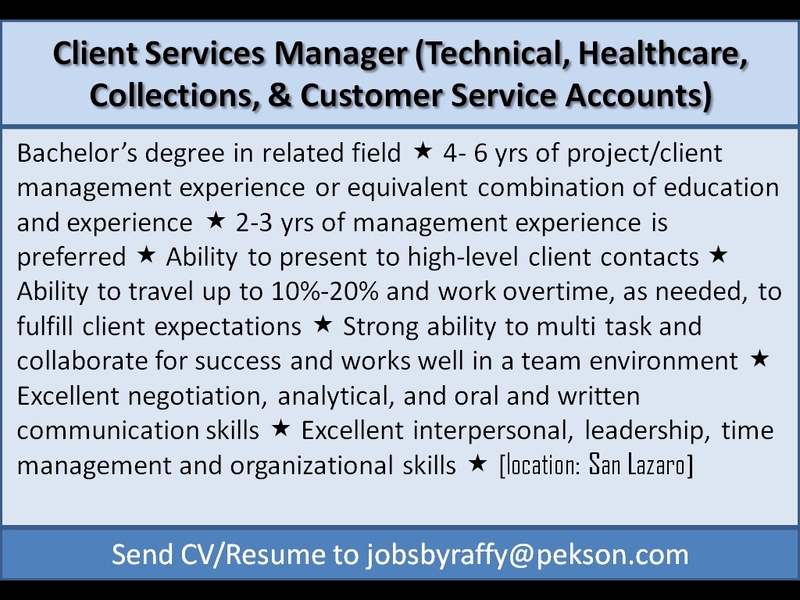 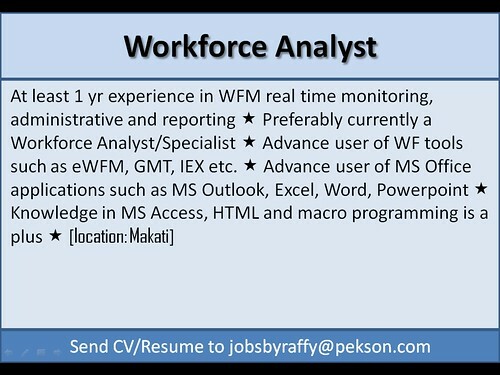 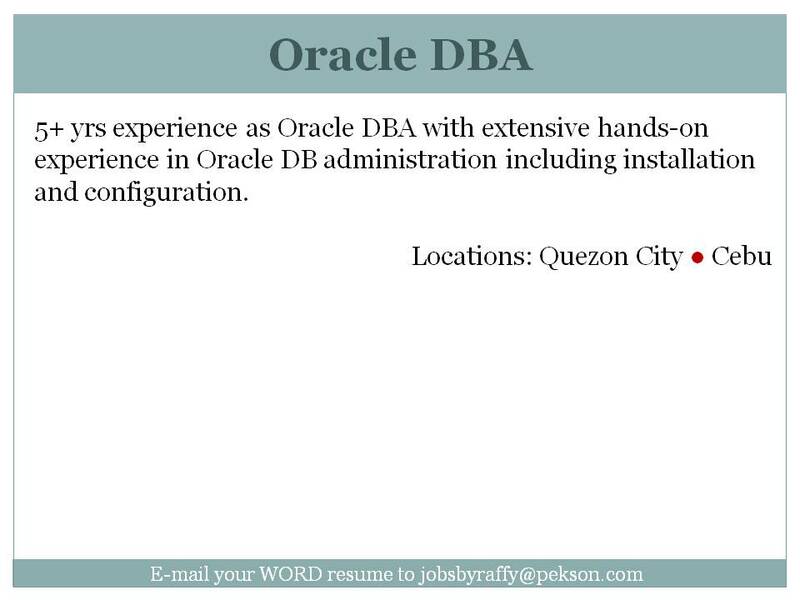 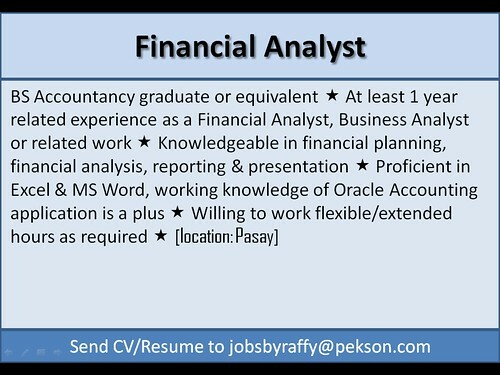 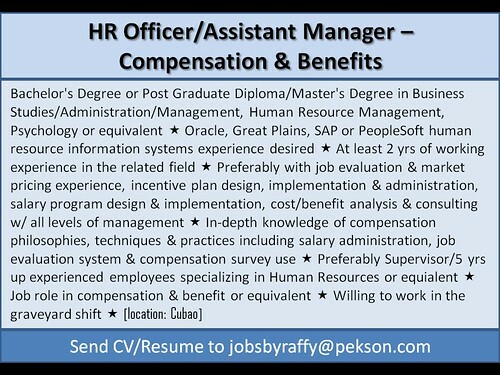 If you qualify, please attach your WORD-formatted resume to an email sent to jobsbyraffy@pekson.com, indicating the POSITION in the Subject-title of the email. 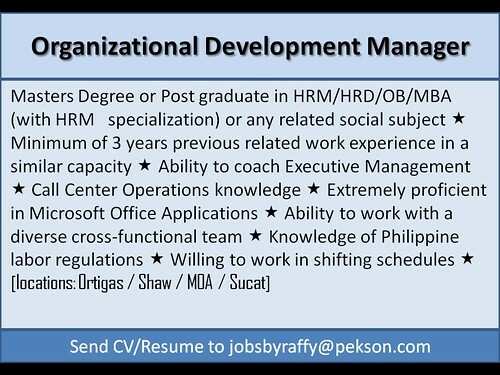 [Philippines] 34 New Job Openings! 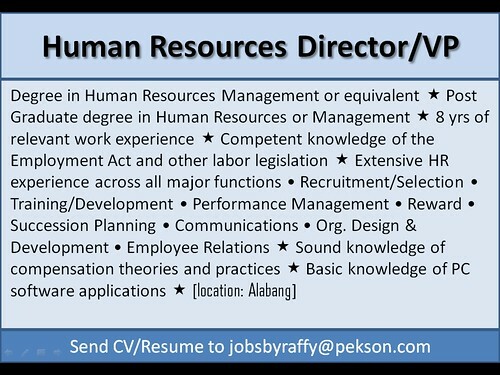 All 34 Positions below are Closed! 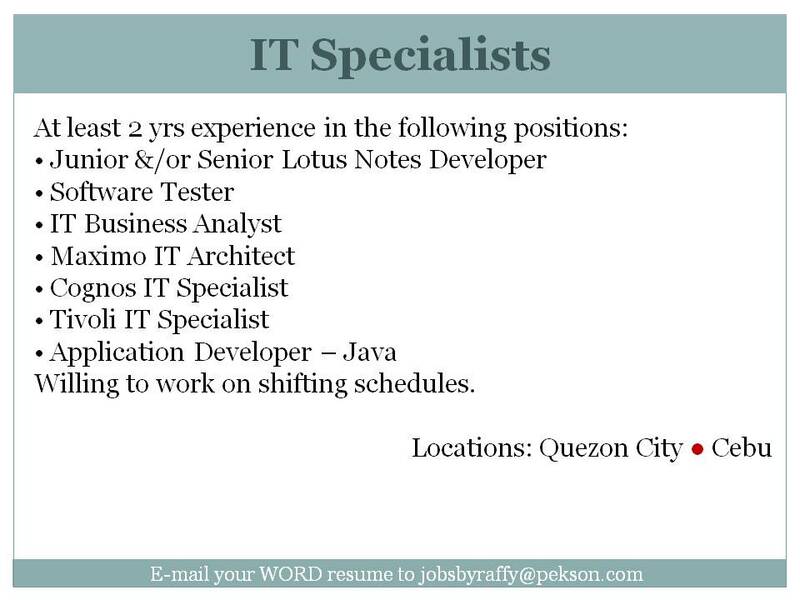 Here are 34 new job openings for the Philippines. 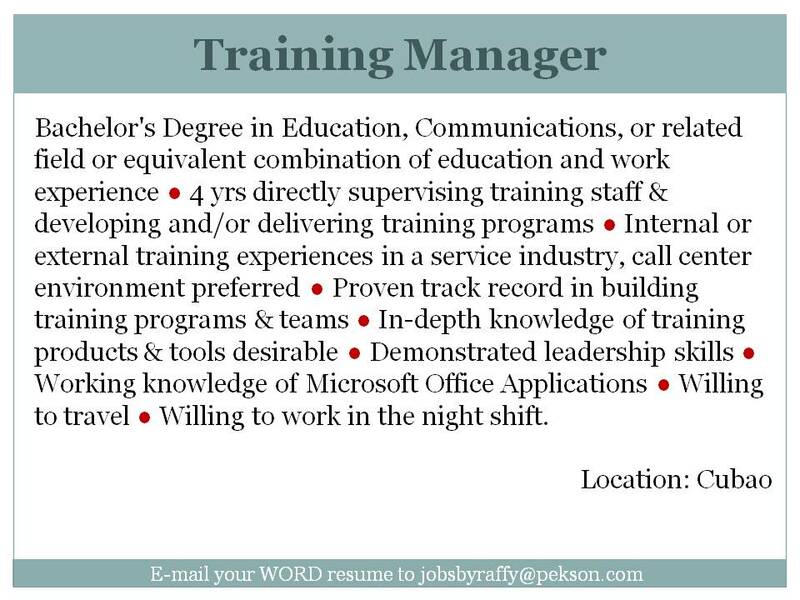 If your education and/or experience is a match to the job description, kindly send your CV/Resume in Word format and indicate in the Subject title of the e-mail what position you are applying for. 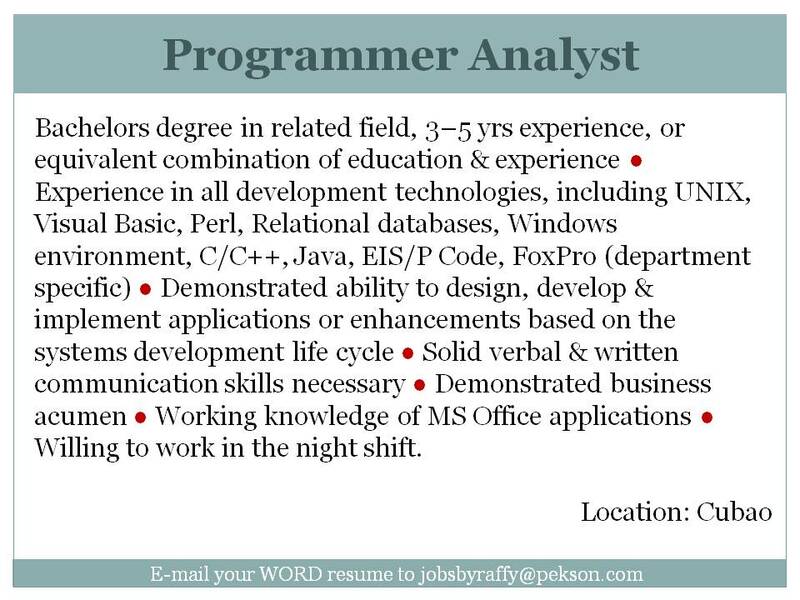 I cannot process “blind e-mails” without an indicated job position. 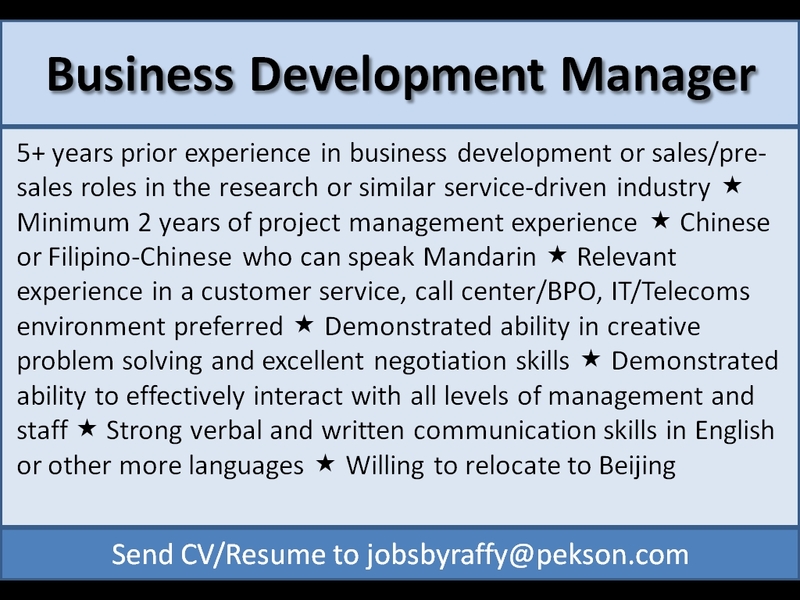 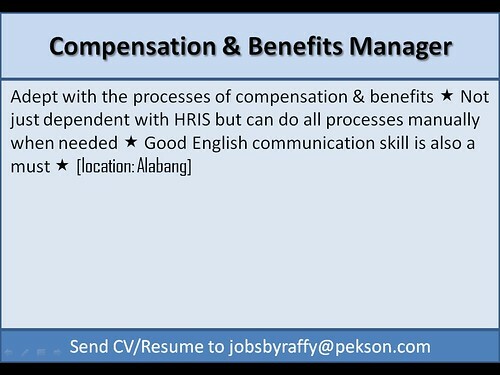 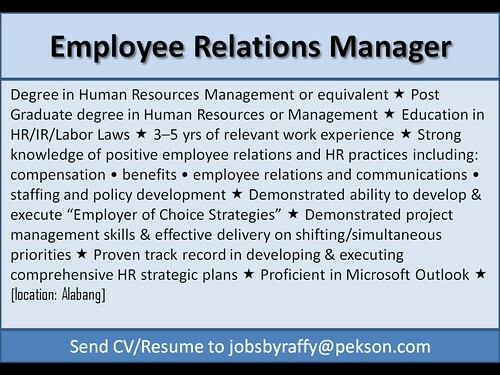 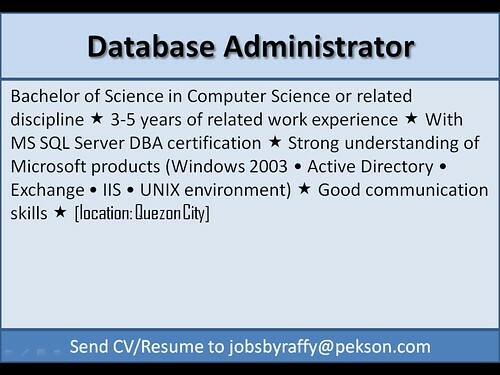 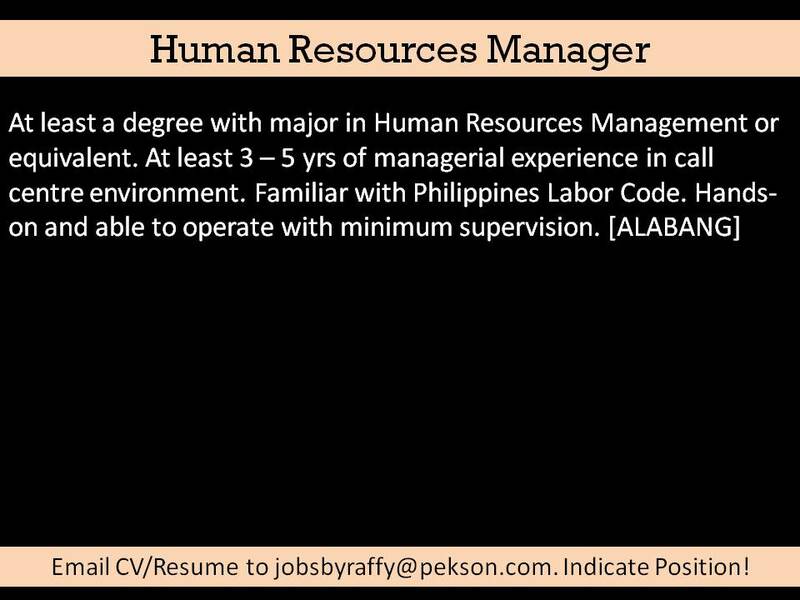 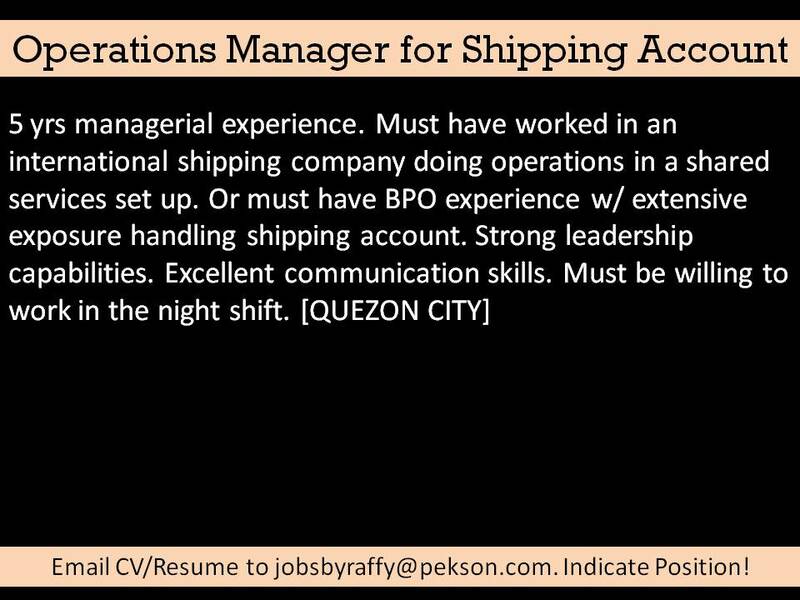 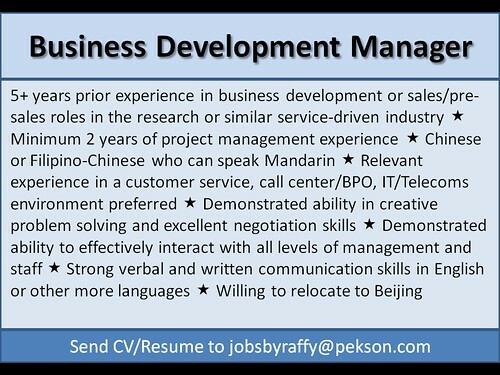 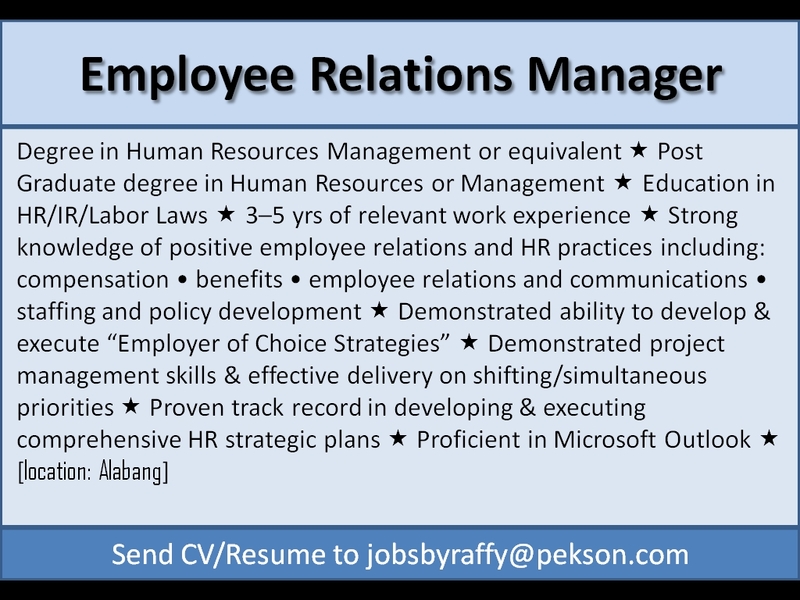 Please use the e-mail address jobsbyraffy@pekson.com. 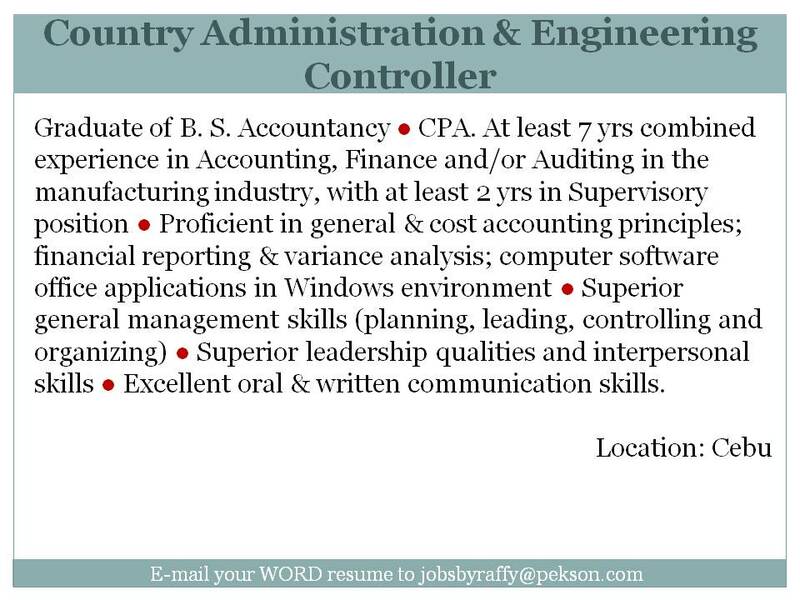 Again, please send your CV/Resume in Word format and indicate the job position you are applying for in the Subject title of your e-mail. 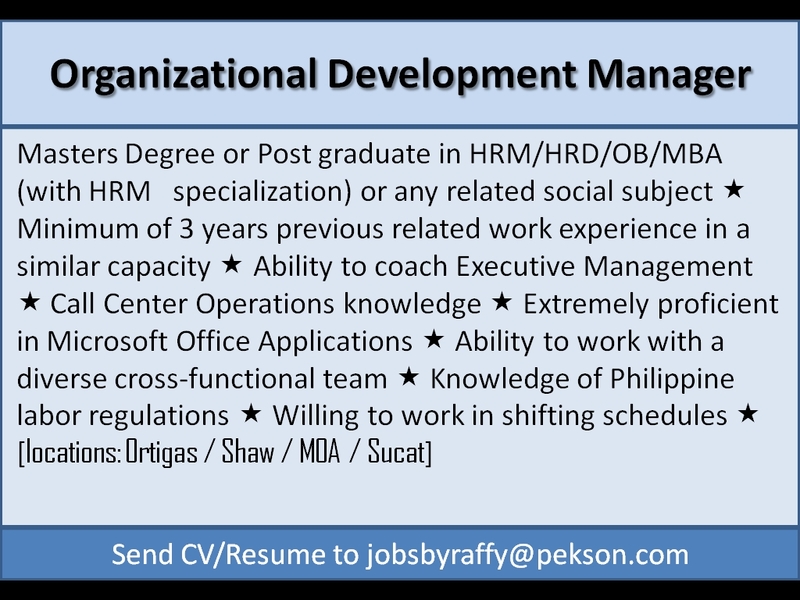 [Philippines] 27 New Job Openings! 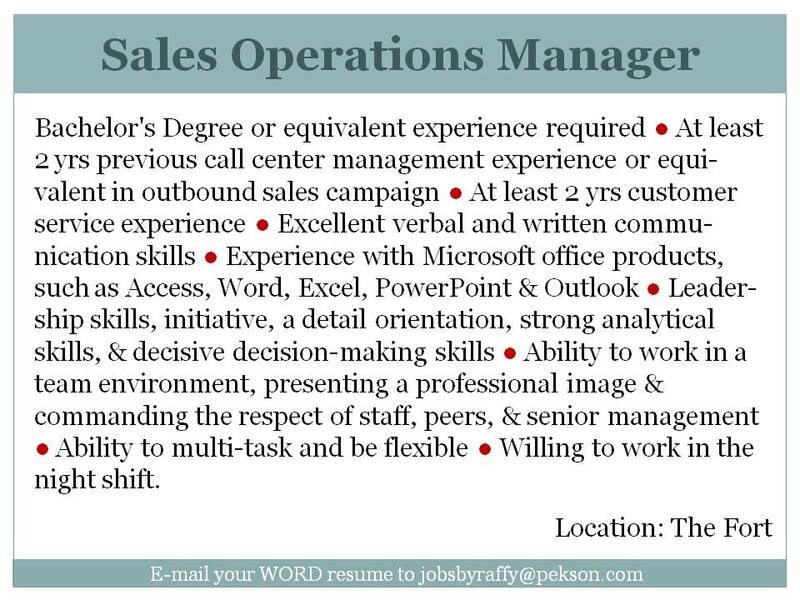 All 27 Job Openings below are Closed! 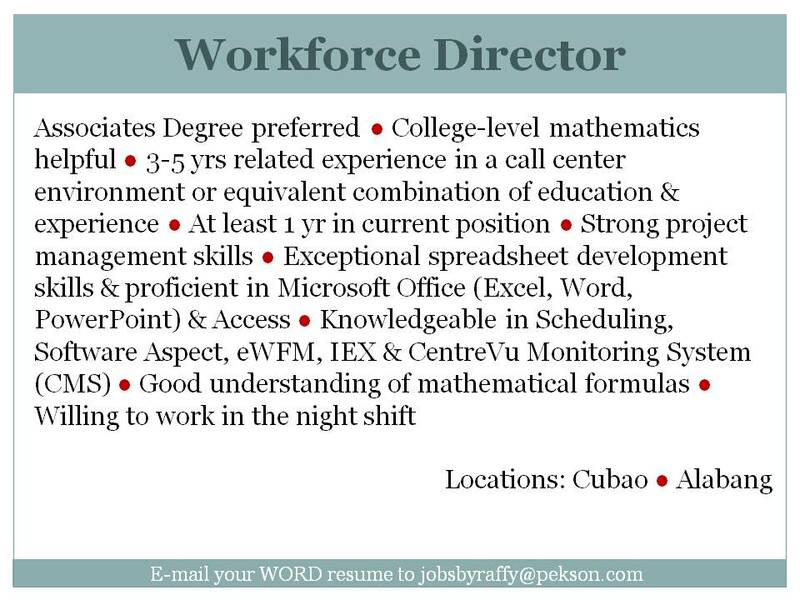 If you see a job of interest and you qualify, kindly send your Microsoft WORD ONLY formatted CV or Resume to jobsbyraffy@pekson.com and indicate the JOB POSITION in the SUBJECT field. 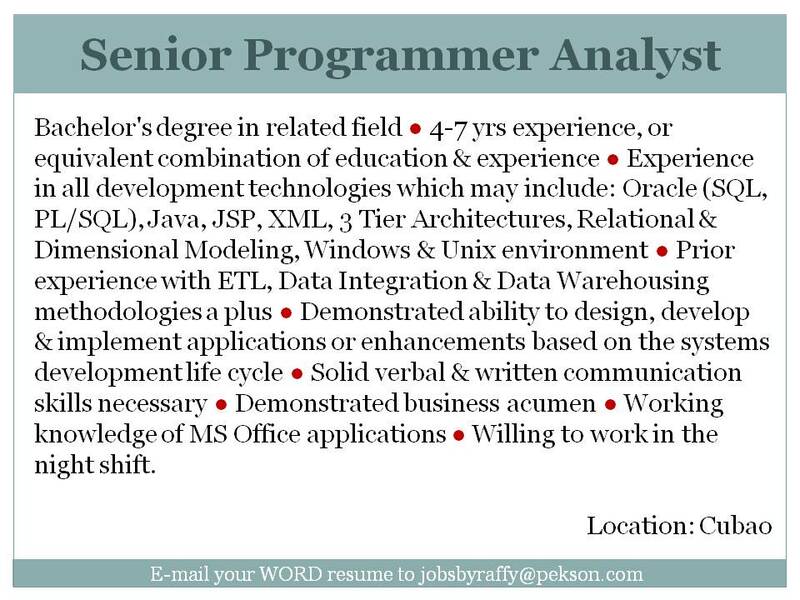 If you do not indicate the Job Position, I cannot process your application. 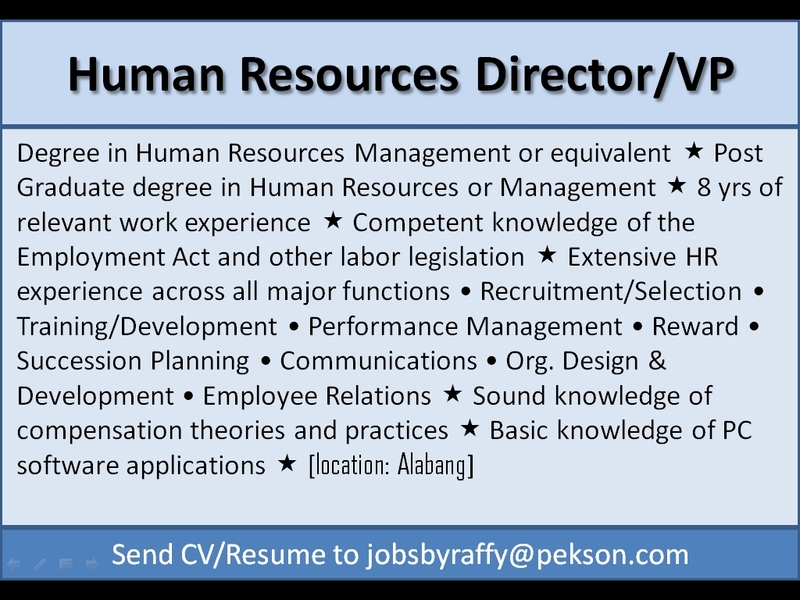 This new list is sorted alphabetically.